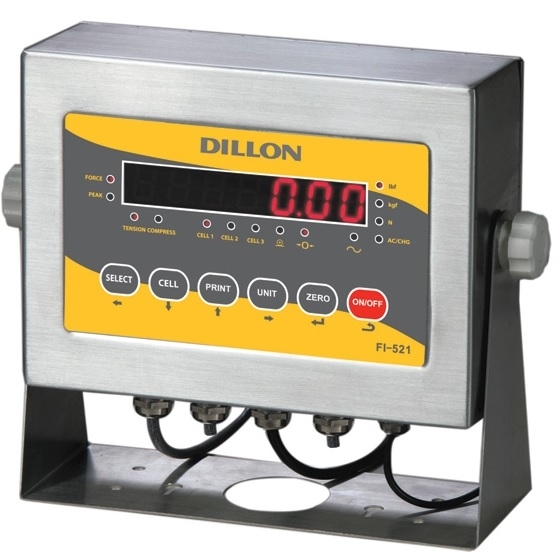 EDjunior Dillon Digital DynamometerIs designed to measure inline force / tension in a wide range of industrial applications. EDX-COMM-II Remote CommunicatorThe radio or hardwired options available with the EDXtreme offer the convenience and safety of remote operation. 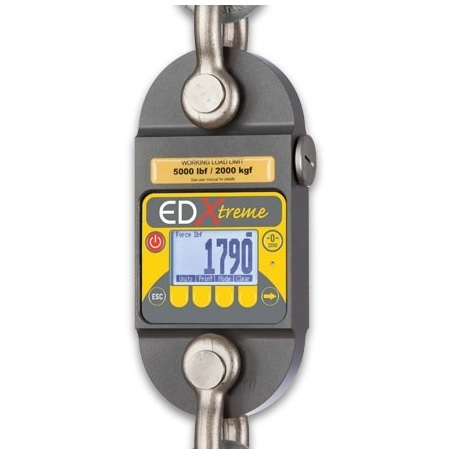 EDxtreme Digital DynamometerDigital Dynamometer. 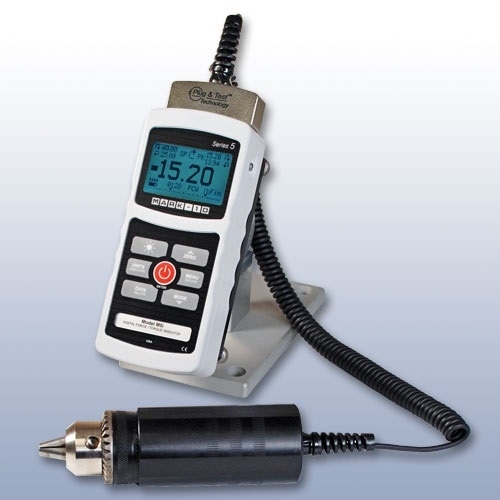 10 Ranges up to 550,000 Lb-f. High resolution and accurate repeatable readings. 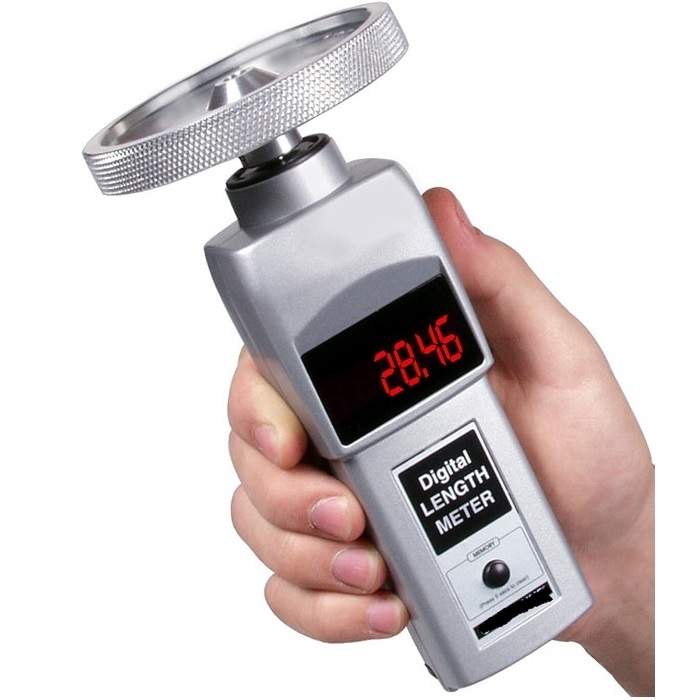 LoadLink-Plus Digital DynamometerDigital Dynamometer with Built-In Display. Capacities up to 300 Tonnes/660,000 lbs. 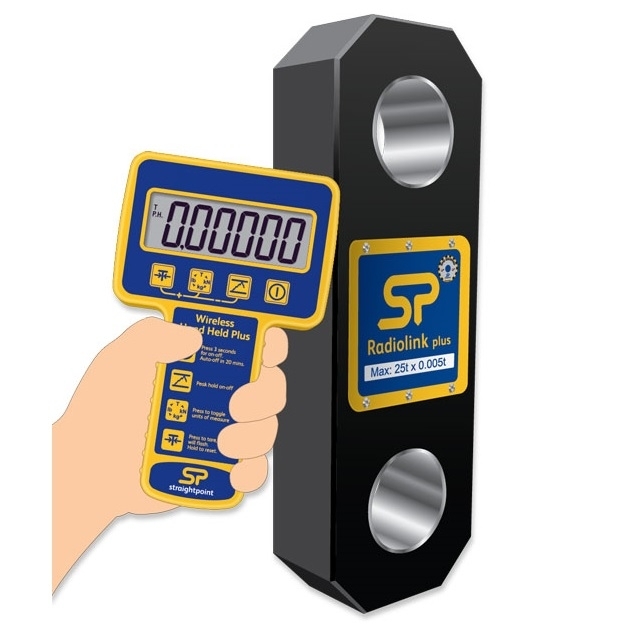 Radiolink-Plus Wireless DynamometerWireless Dynamometer with hand-held digital display. Capacities up to 300 Tonnes / 660,000 lbs. 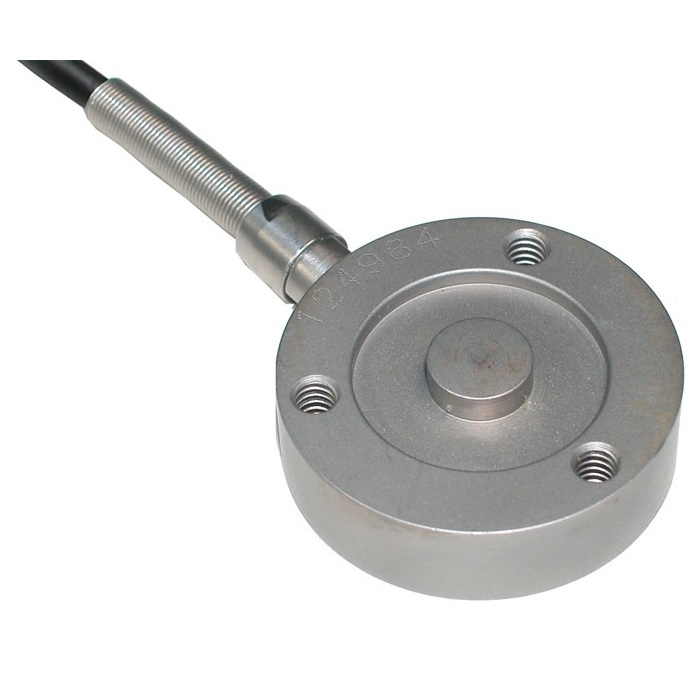 StageSafe Load CellStageSafe Load Cell for Entertainment Rigging. 3te / 3000 Kg / 6600 lb Capacity. Wireless or Wired Operation. 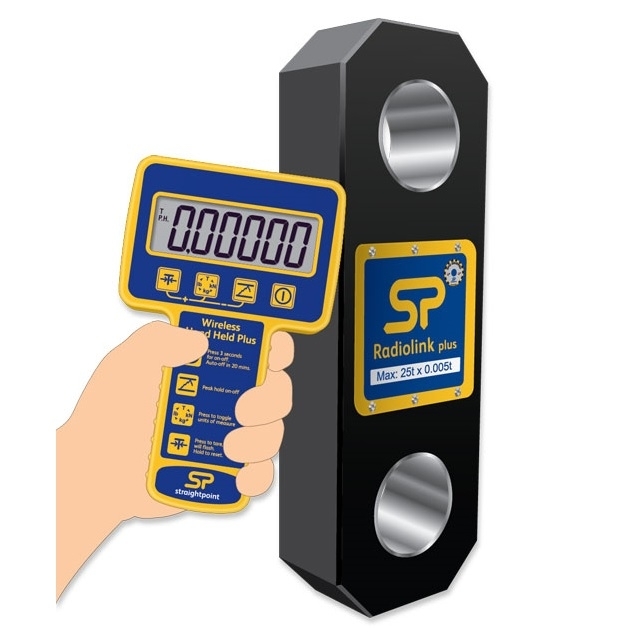 FMI-S10 Digital Force GaugeSolar Powered Digital Force Gauge - Basic Model. 3 Ranges up to 110 lbs / 50 Kg / 500 N. IP65 Splash-proof Housing. 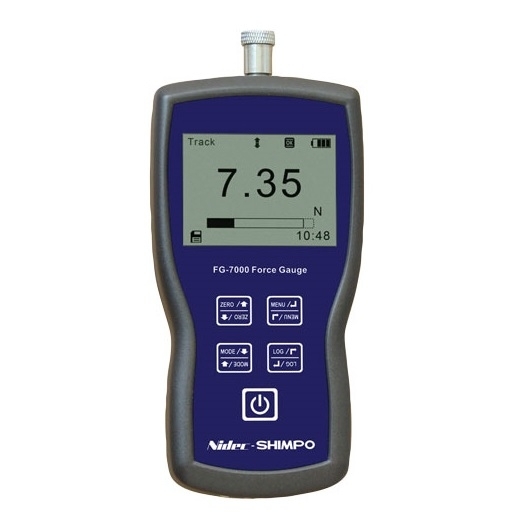 FMI-S20 Digital Force GaugeSolar Powered Digital Force Gauge. 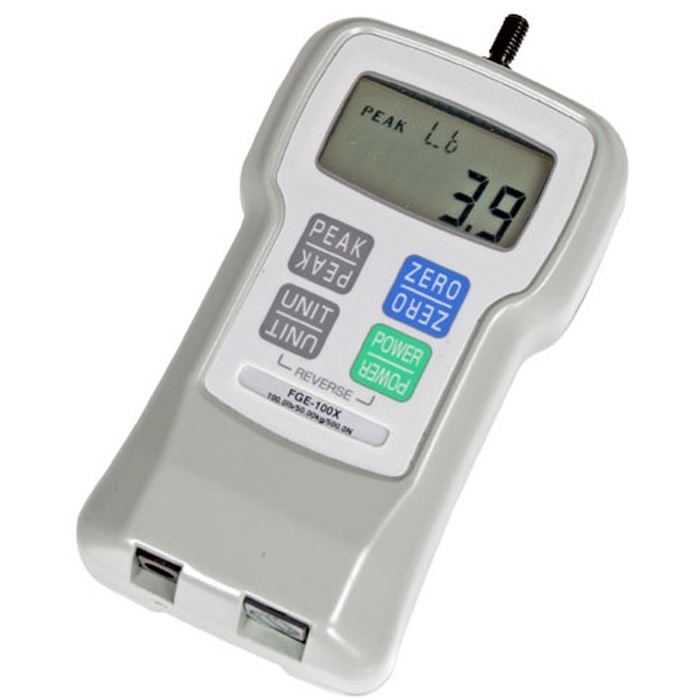 5 Ranges up to 1100 lbs / 500 Kg / 5000 N.
FMI-S30 Digital Force GaugeSolar Powered Digital Force Gauge with USB Data Output. 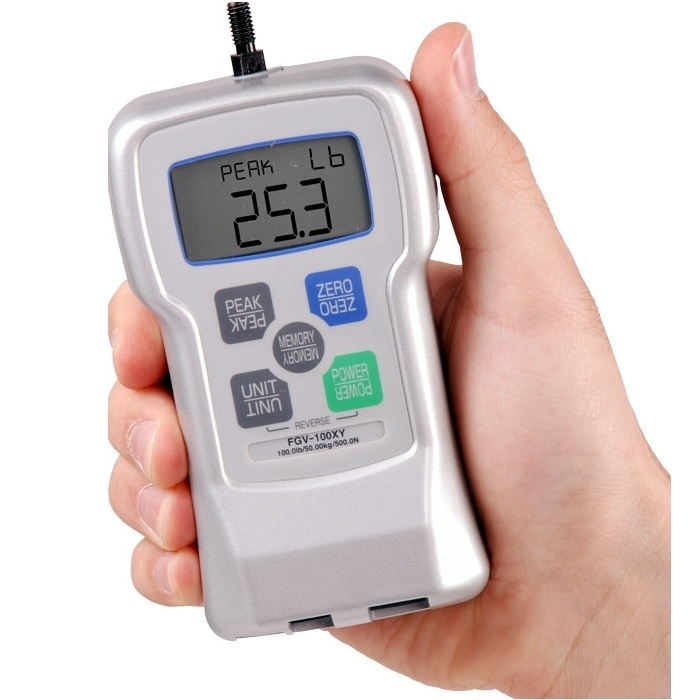 7 Ranges up to 1100 lbs / 500 Kg / 5000 N.
WNI Wireless Compression Load CellsWireless connection to Hand-Held Indicator or direction connection to PC software. 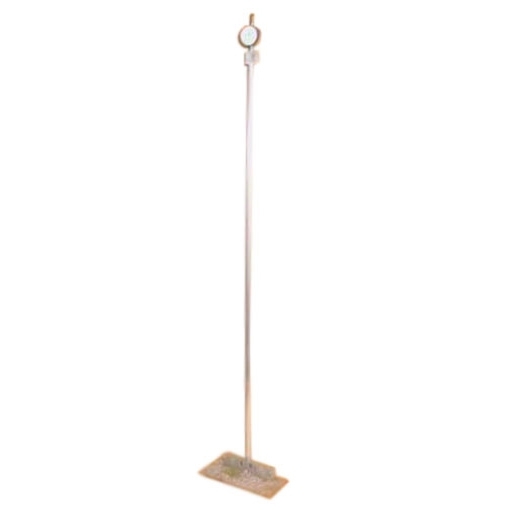 Wireless range of 700 meter/2300 ft.
BlueForce Impact Force GaugeFor use with automatic/power operated doors/gates. 2000N Capacity. 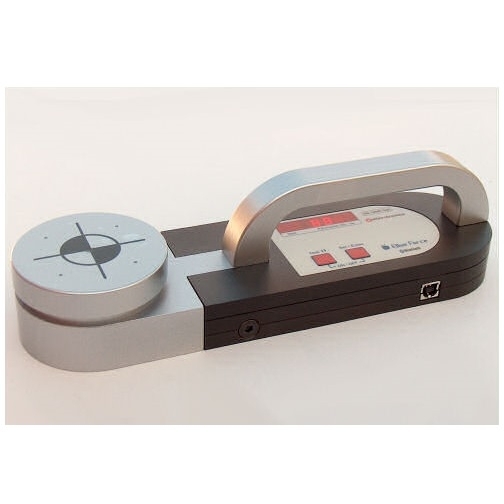 DS2 Digital Force GaugeDS2 measures push and pull forces. 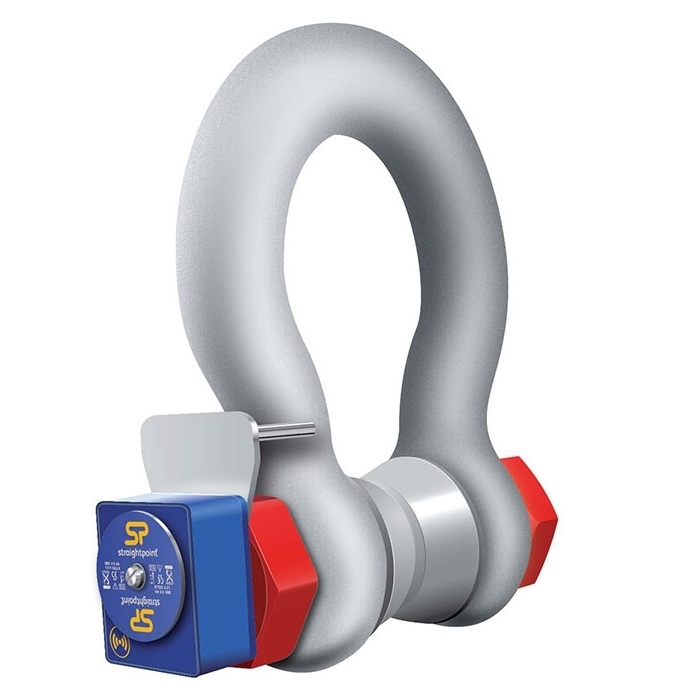 An ergonomic metal housing protects the highly accurate loadcell and electronics in tough industrial environments. 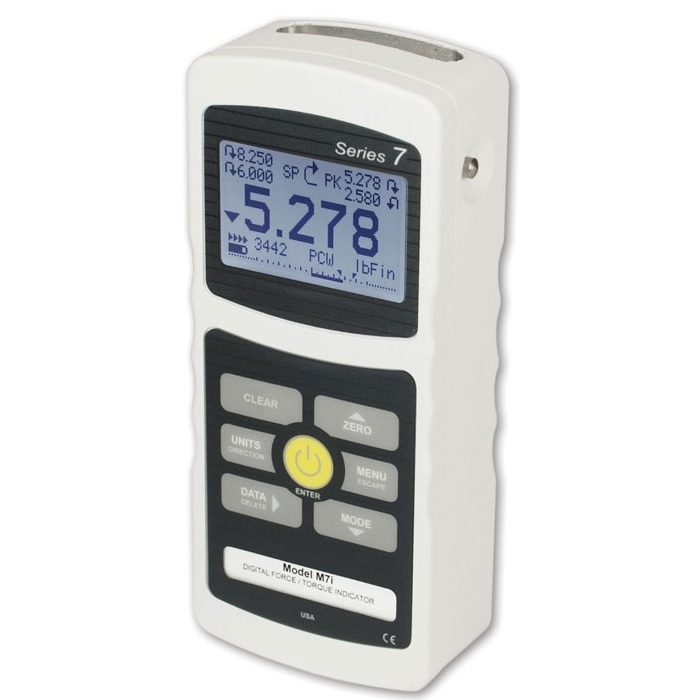 DST Digital Force GaugeThe large backlit LCD display can be configured in basic format to show value, unit and measuring mode or multi-line format to display peak and real time values simultaneously. 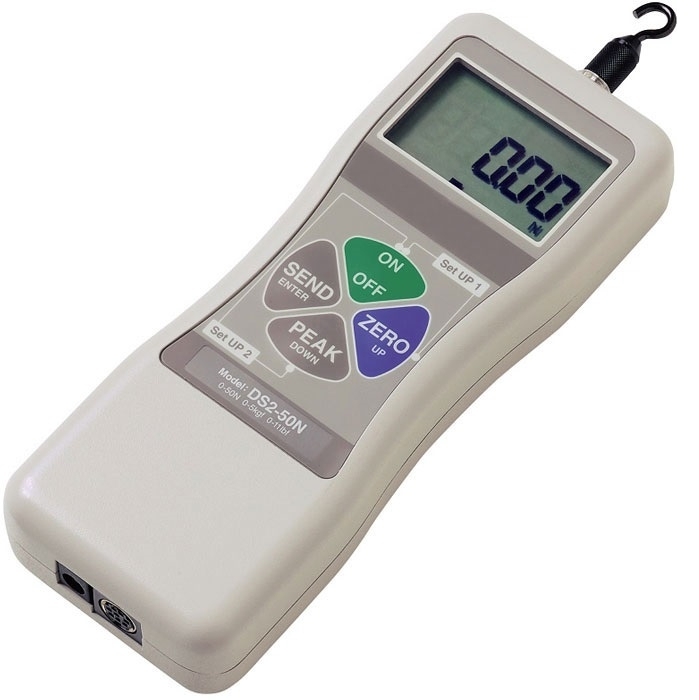 FG-3000 Digital Force GaugeDigital Force gauge with USB Output. Capacities up to 220 lbs/100 Kg/1000 N. ±0.2% accuracy. 500 data point memory. 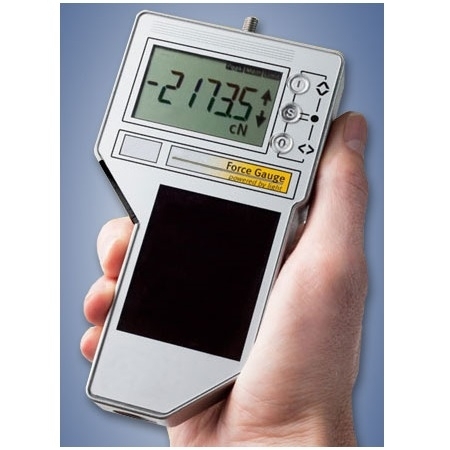 FGE Hand-held Digital Force GaugeThese instruments are utilized in a variety of applications such as, incoming quality inspection, finished goods testing, R&D or almost any portable or force stand testing requirement. 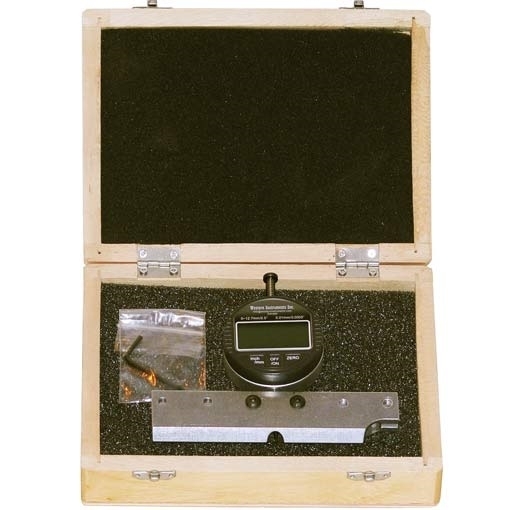 FGE-500HXY Capacity Digital Force GaugeThe FGE-500HXY Capacity Digital Force Gauge measures both push and pull forces up to 500 lbs / 250 kg. 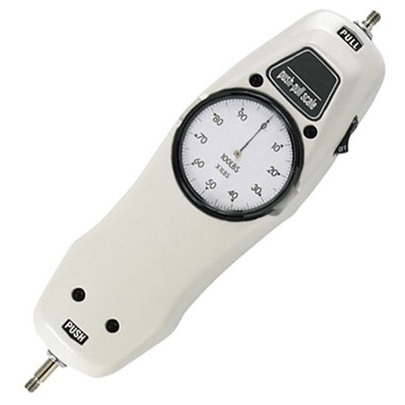 FGE-HX - FGV-HX High Capacity Digital Force GaugeHigh Capacity Digital Force Gauge. Accuracy ± 0.2%. 4 Ranges up to 1000 lbs. 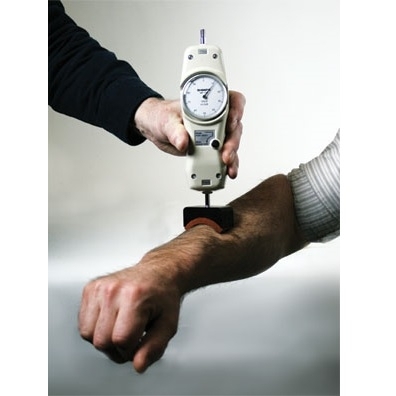 Measure force in lbs, Kgs or N.
FGE-XY Hand-held Digital Force GaugeDigital Force Gauge. Accuracy ± 0.2%. 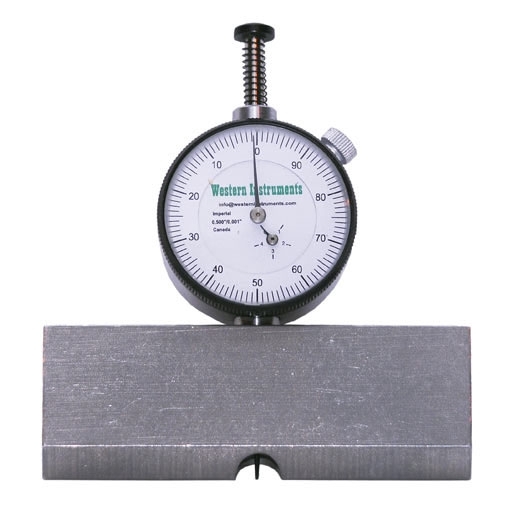 Measure force in lbs, Kgs or N. CE and ROHS certified. 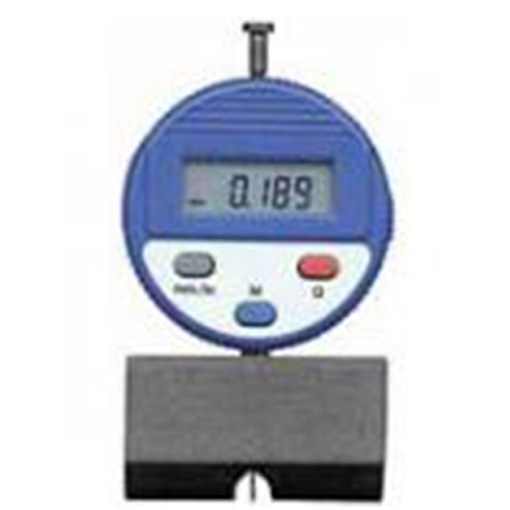 FGV-HXY High Capacity Digital Force GaugesHigh Capacity Digital Force Gauge. Accuracy ± 0.2%. 2 Ranges up to 1000 lbs. 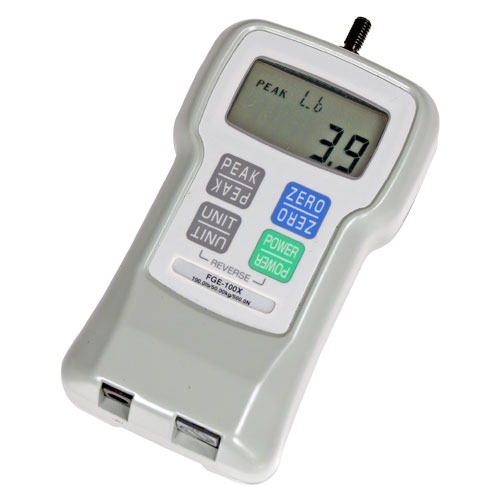 Measure force in lbs, Kgs or N.
FGV-XY Digital Force GaugeDigital Force Gauge with USB Output. Reversible Keypad and Display. 9 Ranges up to 200lbs. 1000 Hz Sample Rate, provides more accurate results. USB, RS-232, Analog Outputs. 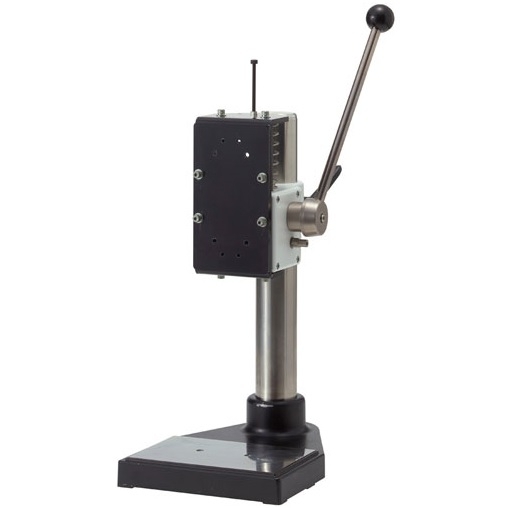 FTS-HD High Capacity Force Test SystemThe FTS-HD is a high capacity force test system engineered for precise & repeatable measurements of push or pull forces up to 1000lbs. 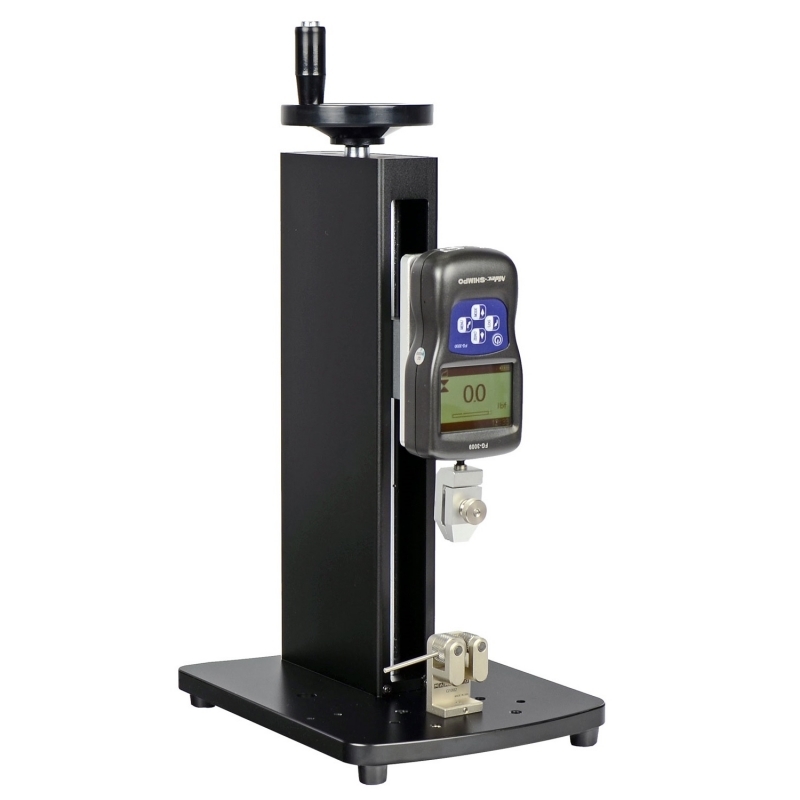 FTS-X Force Test SystemForce Test System with USB Data Output. Available in 5 Ranges up to 110 lbs. 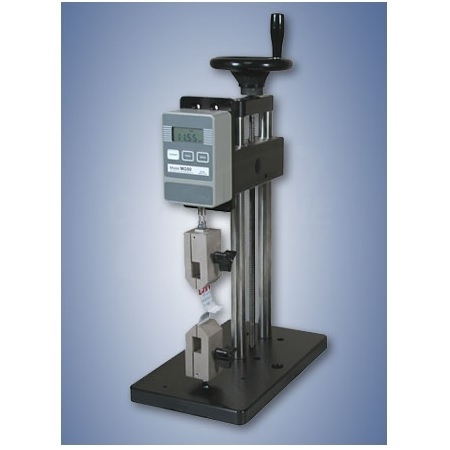 Includes Gauge and Test Stand. M5-2-COF Coefficient of Friction GaugeCalculates static and kinetic coefficients of friction. Configurable sled weight. 1,000-point data memory and statistics. 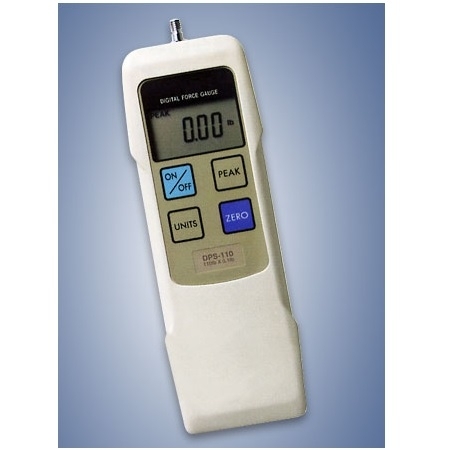 Series-2 Digital Force GaugeBasic Digital Force Gauge. Measures Push and Pull Force. ±0.5% accuracy. 3 Year Warranty. 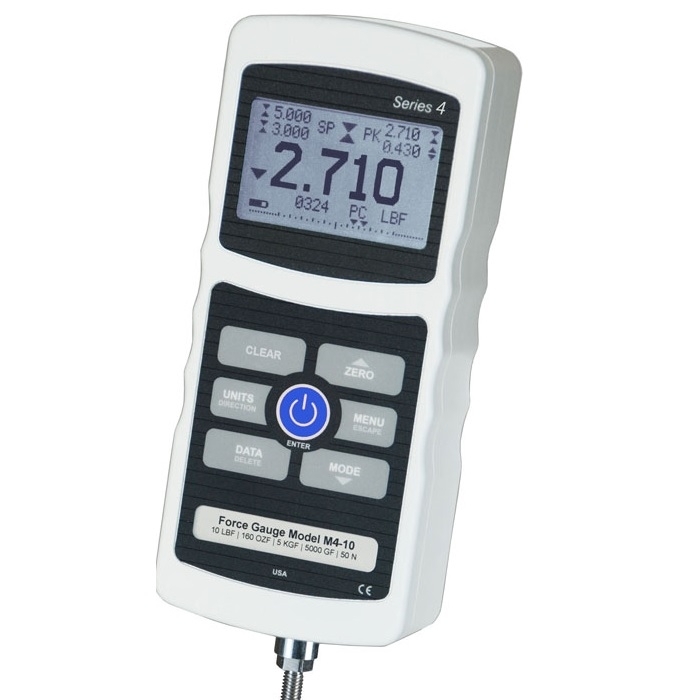 Series-3 Digital Force GaugeDigital Force Gauge with USB Output. 2,000 Hz peak sampling rate. ±0.3% accuracy. 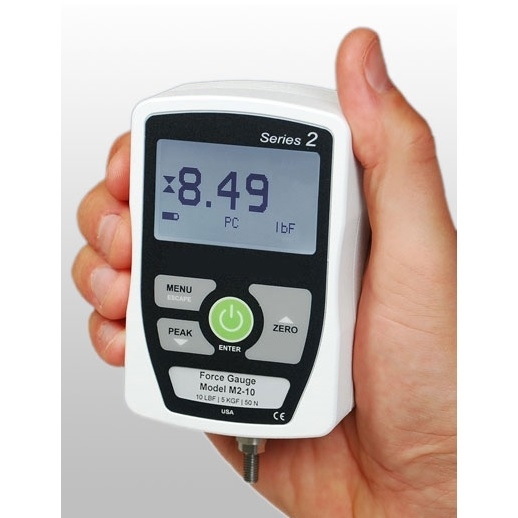 Series-4 Digital Force GaugeDigital Force Gauge with USB Ouput & Software. 3,000 Hz peak sampling rate. ±0.2% accuracy. 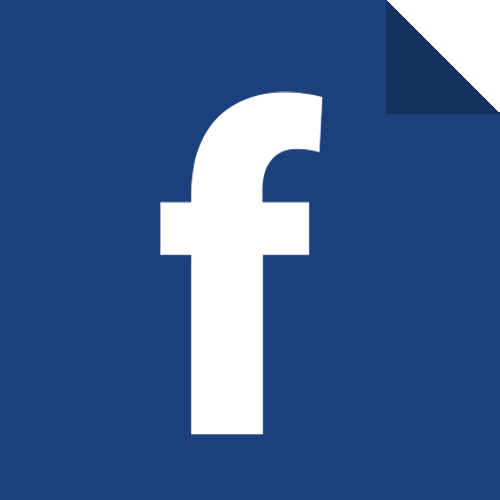 50 point data memory and statistics. 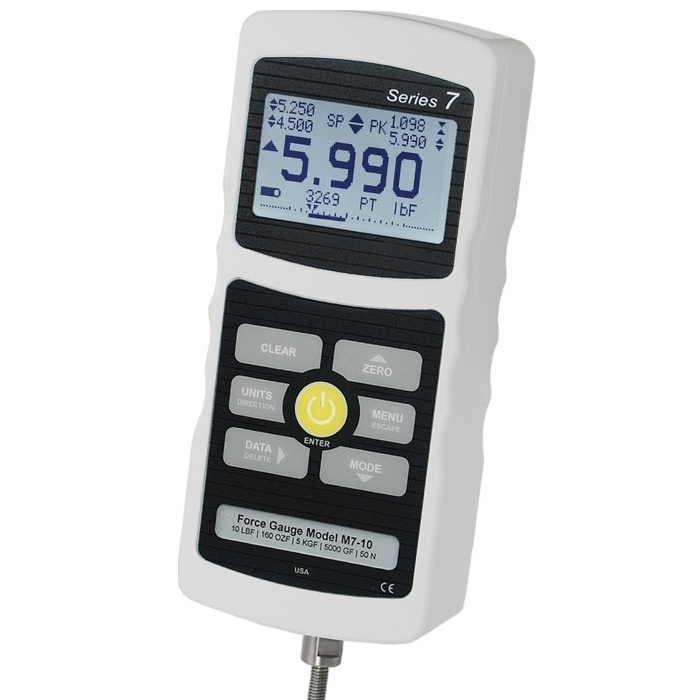 Series-5 Digital Force GaugeAdvanced Digital Force Gauge with USB Ouput & Software. 7,000 Hz peak sampling rate. ±0.1% accuracy. 1,000 point data memory and statistics. 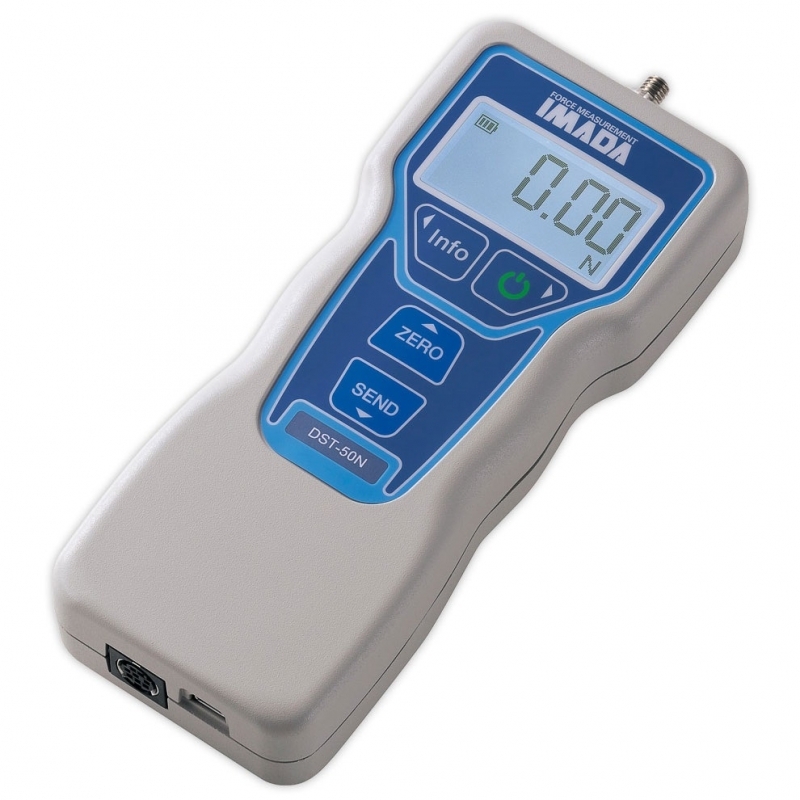 Series-5i Advanced Force/Torque IndicatorAdvanced Digital Force Gauge with USB Ouput & Software. 7,000 Hz sampling rate. ±0.1% accuracy. 1,000 point data memory and statistics. USB, RS-232, Mitutoyo, and analog outputs. 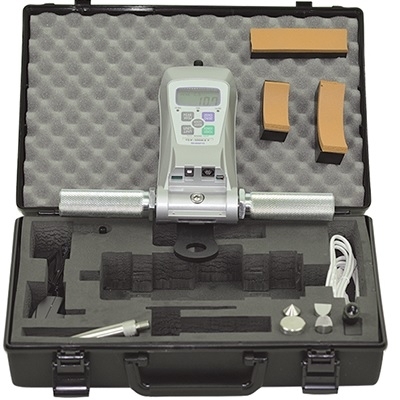 Series-7 Professional Digital Force GaugeProfessional Digital Force Gauge with USB Ouput & Software. 14,000 Hz peak sampling rate. 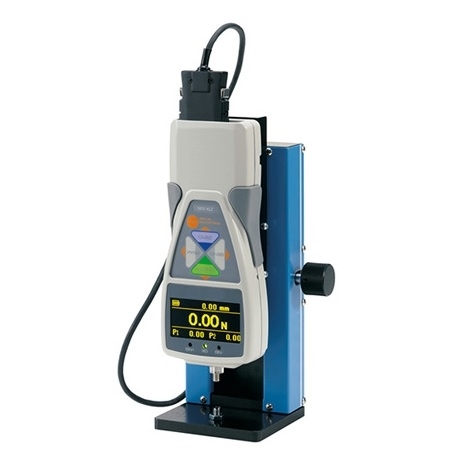 Continuous data capture with 5,000-data point buffer and bulk output. 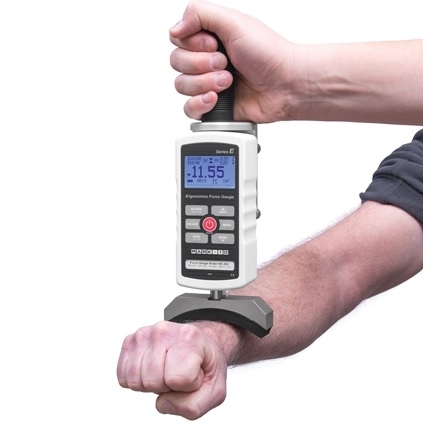 Series-7i Professional Force and Torque IndicatorProfessional Digital Force Gauge with USB Ouput & Software. 14,000 Hz sampling rate. Continuous/single data point capture for 5,000 readings, with statistics. 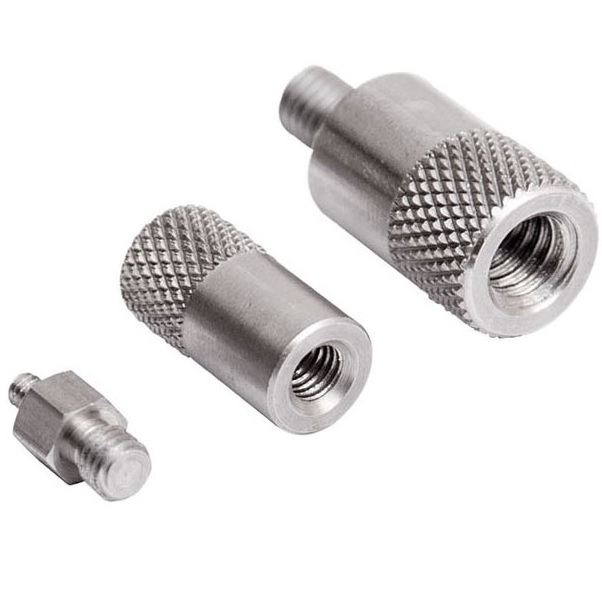 Thread AdaptersConnect force gauges and attachments with different thread sizes. 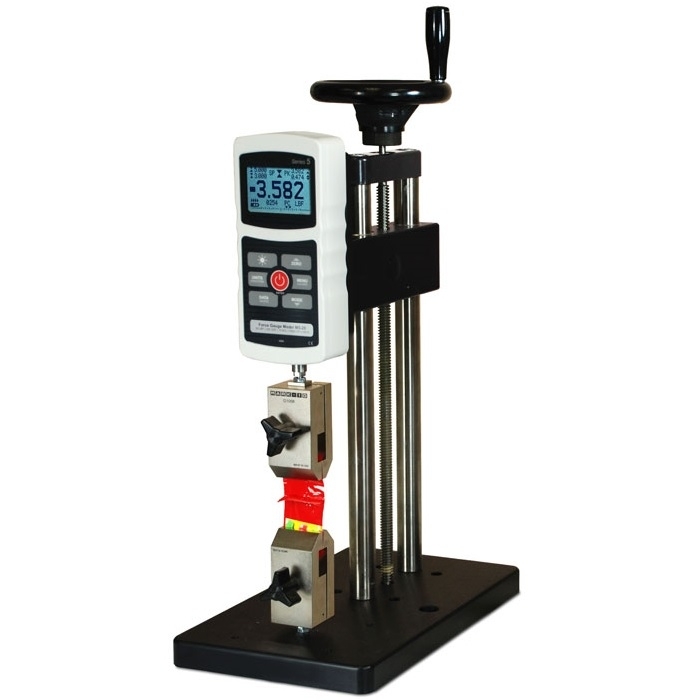 Use them with a force gauge and a test stand to create a complete testing system. 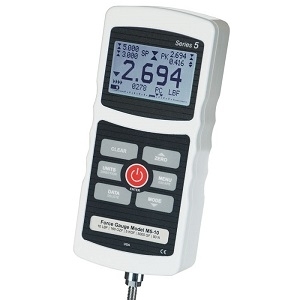 ZTA Digital Force GaugeDigital Force Gauge with high speed data output, up to 2000hz. Ranges up to 1100 lbf. 1,000 Data Memory. 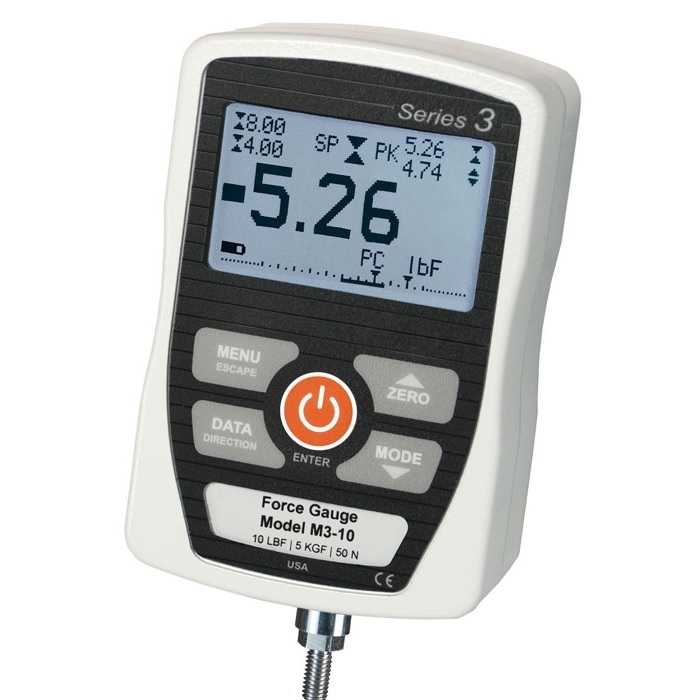 Selectable units: lbf, kgf, N.
ZTA-DPU Digital Force GaugeRemote Sensor Digital Force Gauge with Output. Accuracy ± 0.2%. 11 Ranges up to 4,400 lbs. 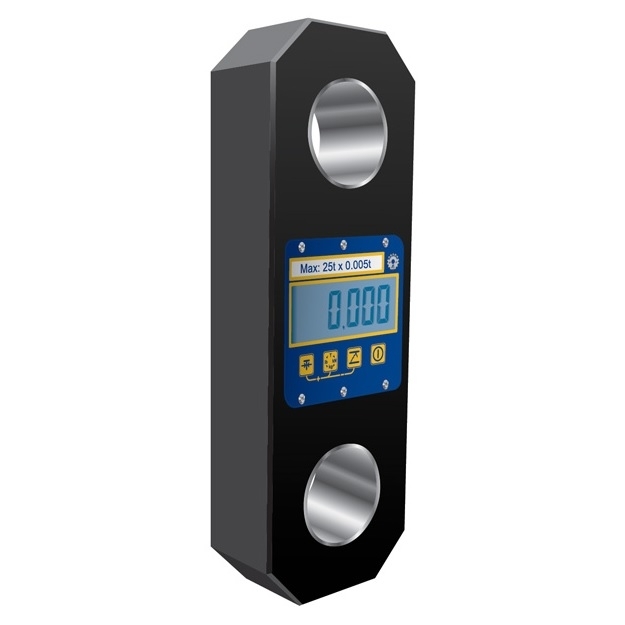 Measure force in lbs, Kgs or N.
ZTA-LM Digital Compression Force GaugeRemote Compression Sensor Digital Force Gauge with Output. Accuracy ± 0.2%. 11 Ranges up to 4,400 lbs. 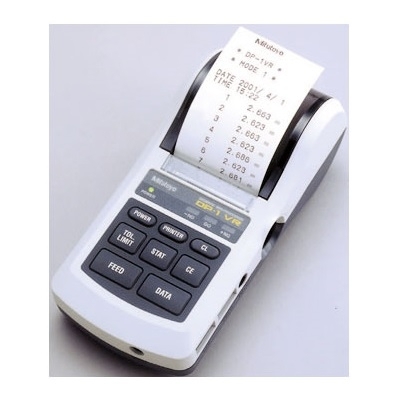 Measure force in lbs, Kgs or N.
DB-1X-DB2-X Data Input ButtonData Input Button. Send data to a PC spread sheet with the touch of a button. 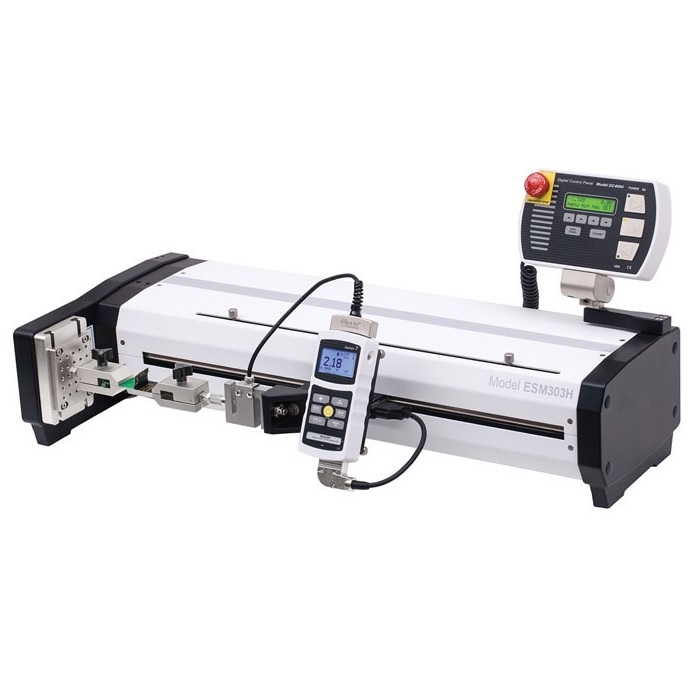 DP-1VR Mitutoyo SPC statistical processor/printerPortable printer for use with force and torque gauges. 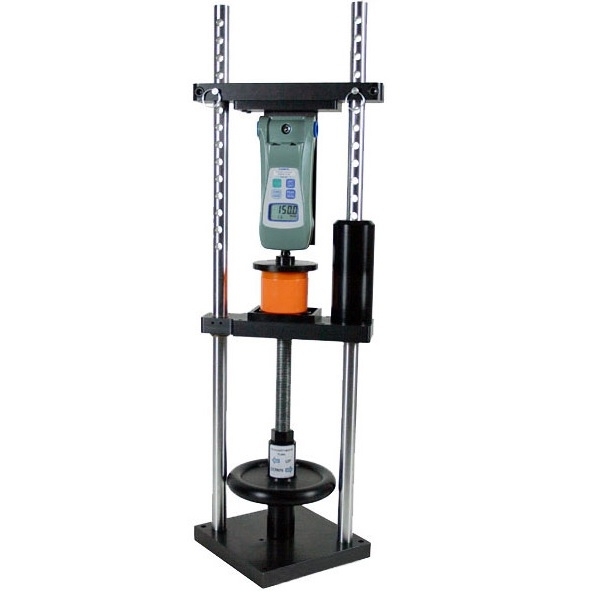 LP-99 Lexan Safety ShieldThe lexan safety shield offers protection to the operators of motorized test stands. Access to the test stand controls is still available through the front of the shield. 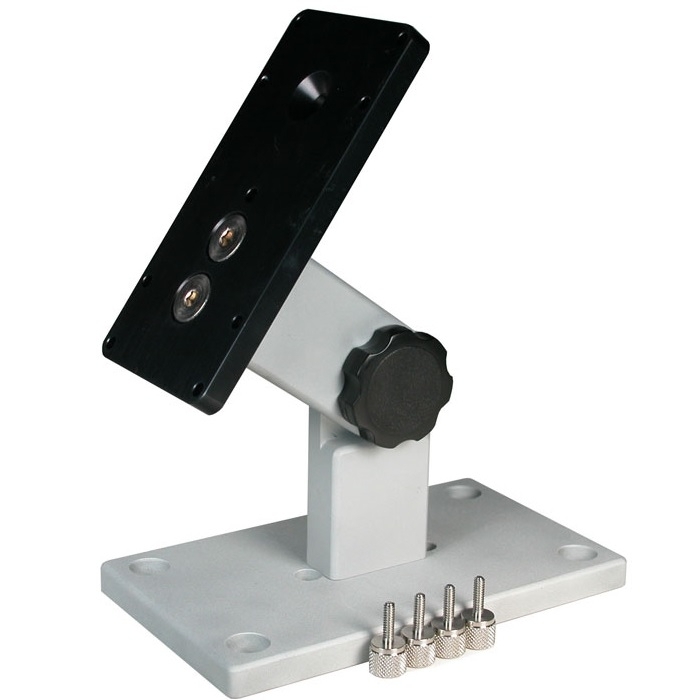 AC1008 Table Top StandTable Top Stand For 3i, 5i, 7i force & torque displays. 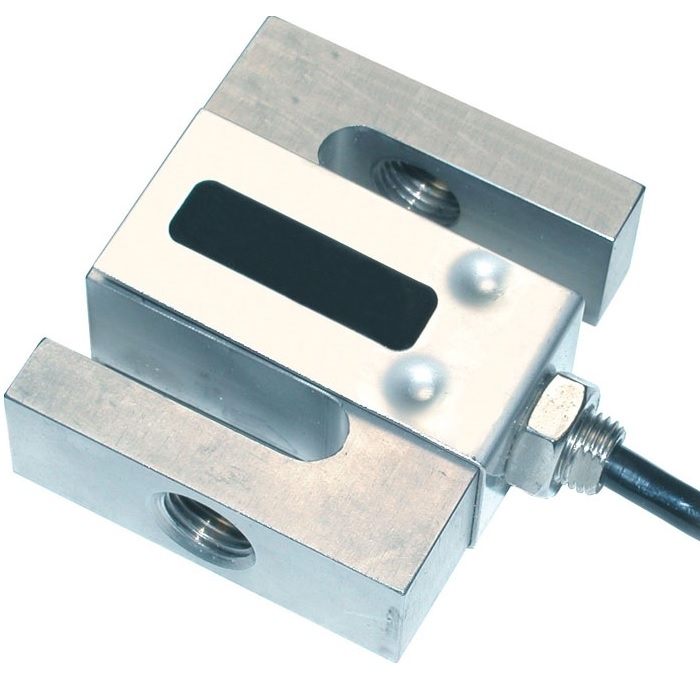 FI-521 LED Load Cell IndicatorThe FI-521 is a bi-directional load cell instrument accepting both positive and negative load cell signals, internally performing the analog to digital conversion at 80 times per second. 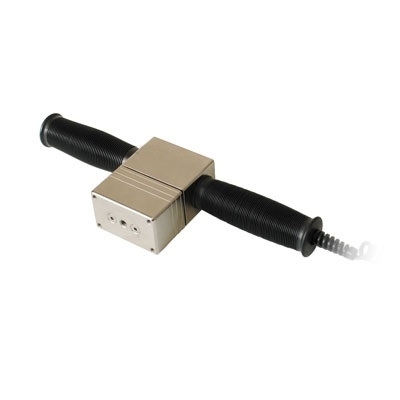 MR06-200 Wire Crimp Pull Sensor TesterHand-Operated Wire Pull Tester. 200 lbF / 1000 N capacity. 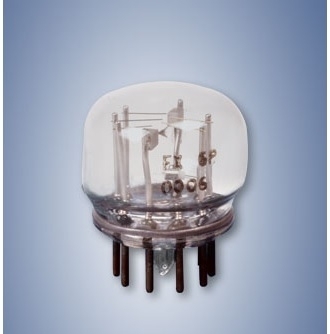 Accommodates a wide range of wire diameters, up to 0.25 in. (6.4 mm) / 20 - 3 AWG. R01 S-Beam Force SensorRugged "S-beam" force sensor. 8 Ranges up to 10,000 lbs. 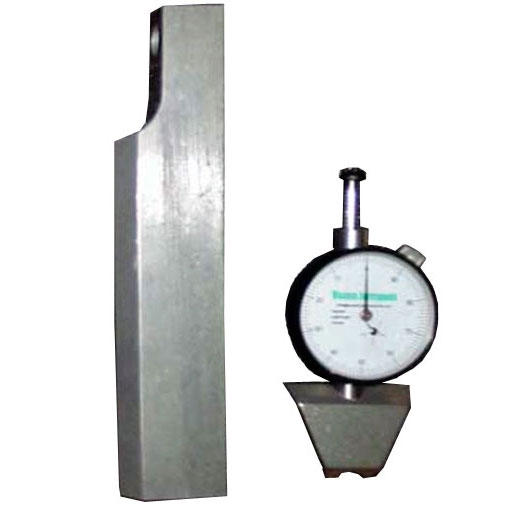 Measures tensile and compressive forces. 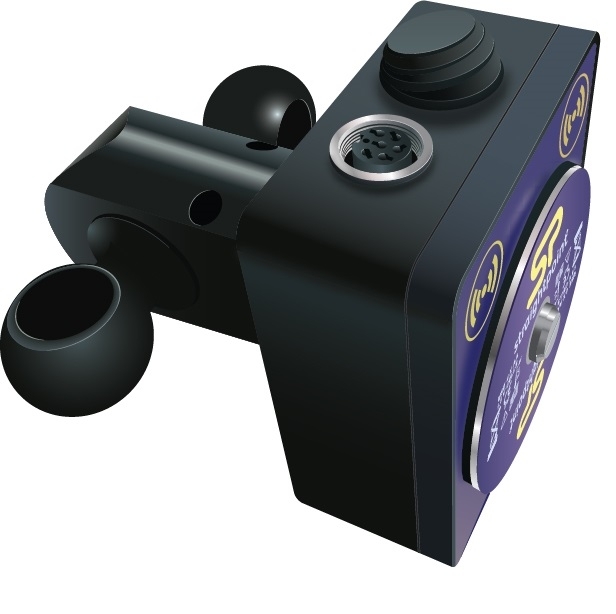 R02 Compression Force SensorButton sensor for compressive loads of up to 10,000 lb. Compact and rugged, the R02 is ideal for heavy duty applications with space constraints. 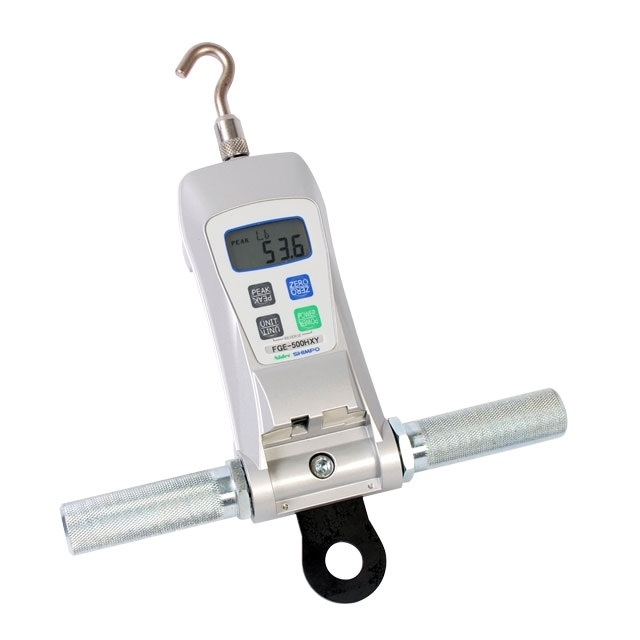 R03 Tension and Compression Force SensorTension and Compression Force Sensor. 8 Ranges up to 100 lbs. 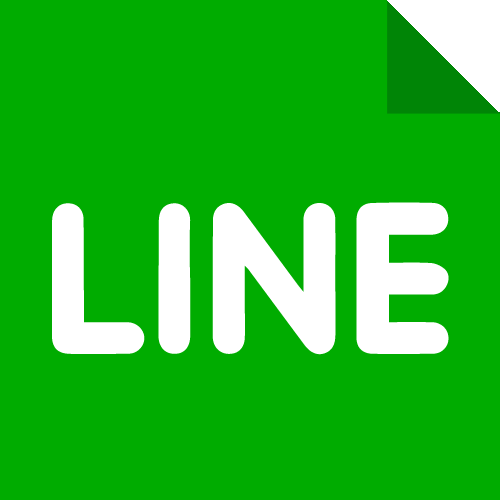 Well suited for inline tests. 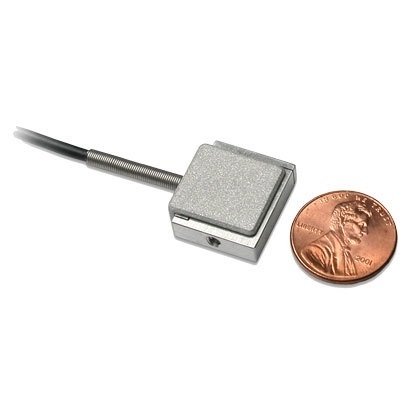 R04 Miniature S-Beam Force SensorExtremely compact force measurement sensor for tensile and compressive loads in applications with limited space. 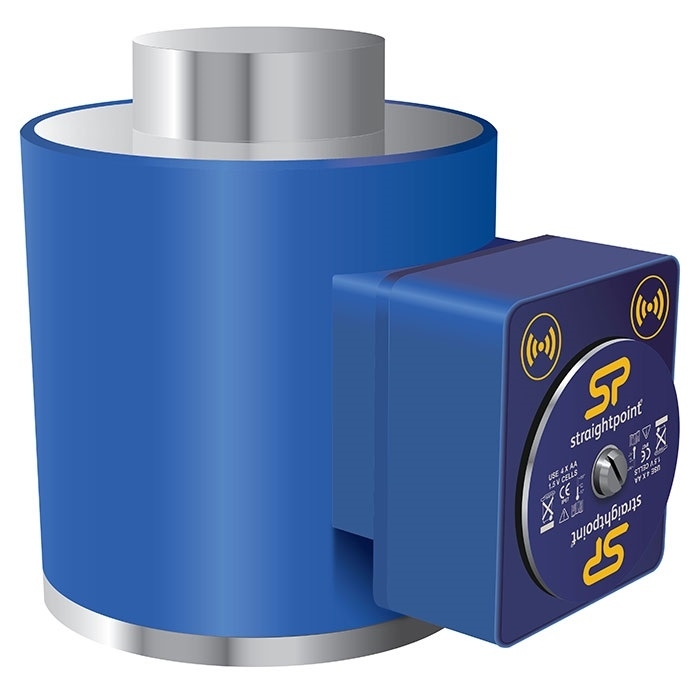 R05 Push/Pull SensorR05 fully enclosed smart sensors are designed for pull / push measurements. 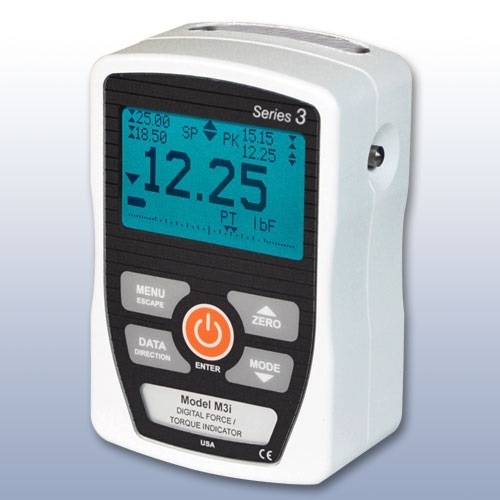 Series-3i Force and Torque IndicatorRemote Sensor Force / Torque Display. 2,000 Hz sampling rate. ±0.2% accuracy. USB output. 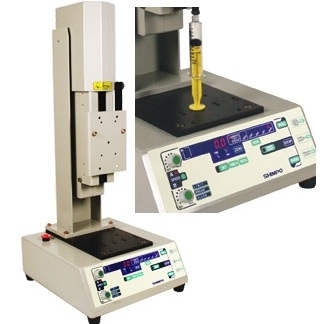 FTS-3000 Force Test SystemThe FTS-3000 is a complete Force Test System designed for compression and tensile testing. 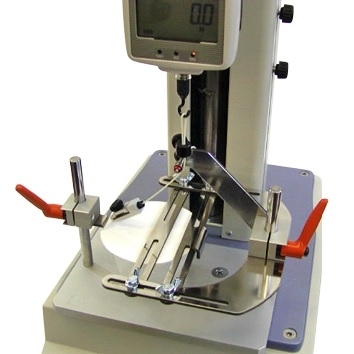 FTS-MG Force Test SystemDesigned for compression and tensile testing of small samples. 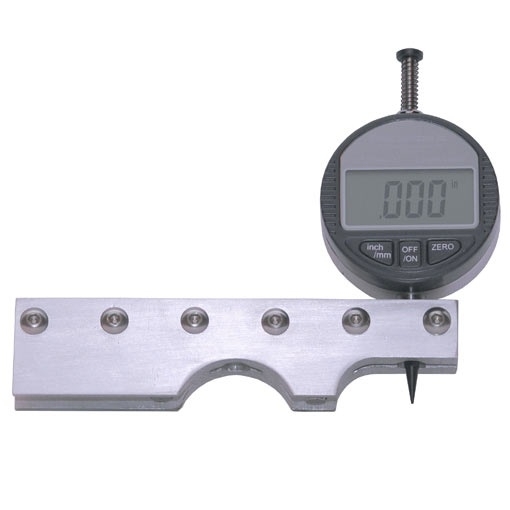 It precisely measures push pull forces as low as 0.0001 lb with an accuracy of ± 0.5% full scale ±1 digit. 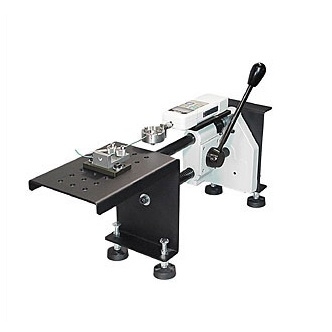 WTT-1000 Wire Pull TesterThe WTT-1000 is a manual pull tester designed for checking wire terminal crimp strength per UL and MIL specifications. 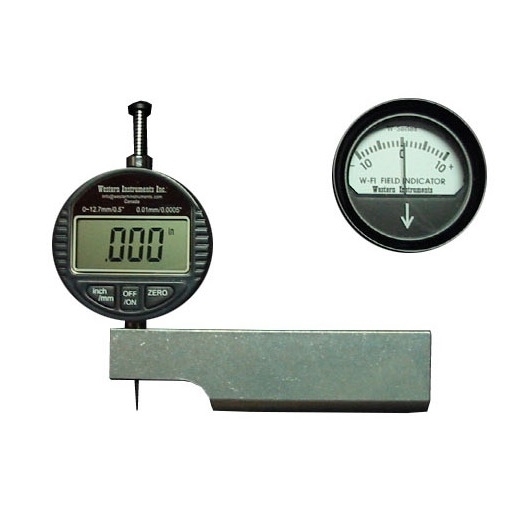 DPS Digital Force GaugeDigital Force Gauge with Output. Accuracy ± 0.2%. 7 Ranges up to 220 lbs. RS-232C, Digimatic and Analog outputs. 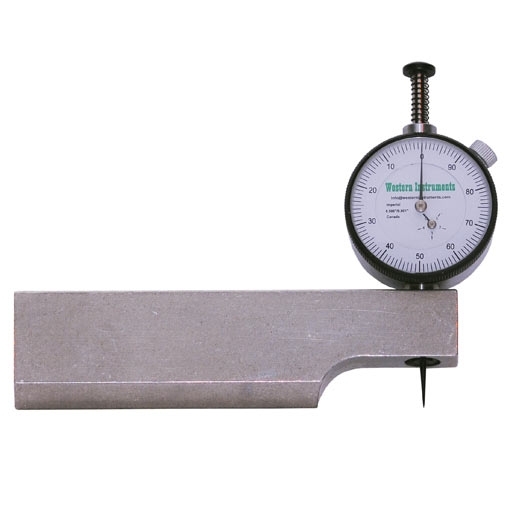 Imada Force Gauge Grips and AttachmentsComplete range of grips and attachments designed for use with Imada force gauges. 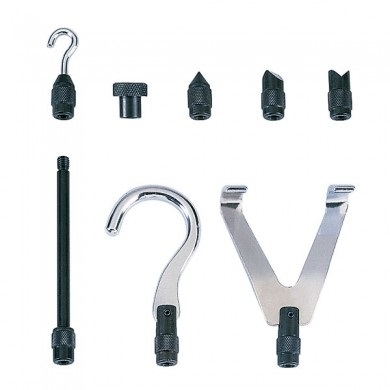 Film grips, wedge grips, vise grips and more. 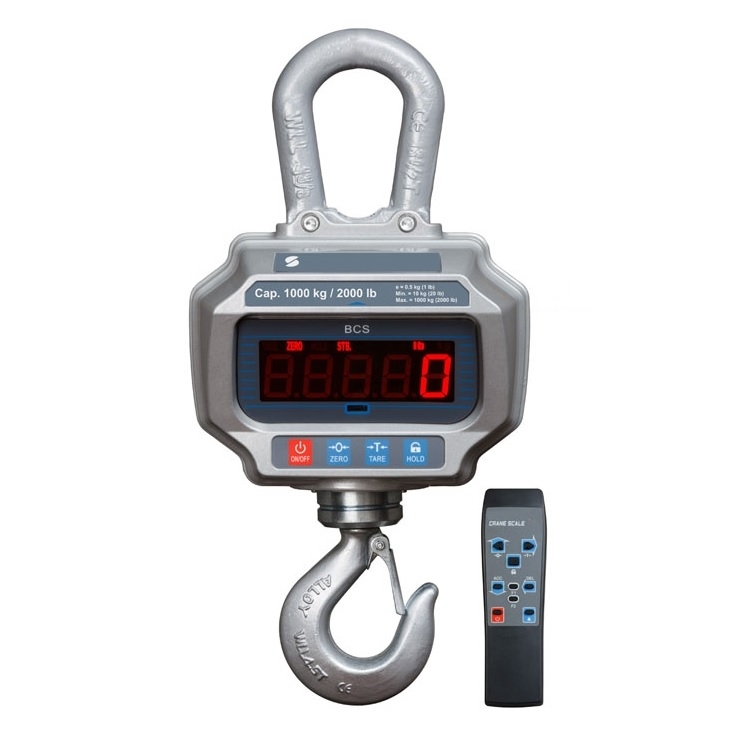 WLS Wireless Load ShackleWireless Loadshackle are designed to measure tension / weight in limited headroom applications. Capacities up to 880000 lbs / 400 tonnes. 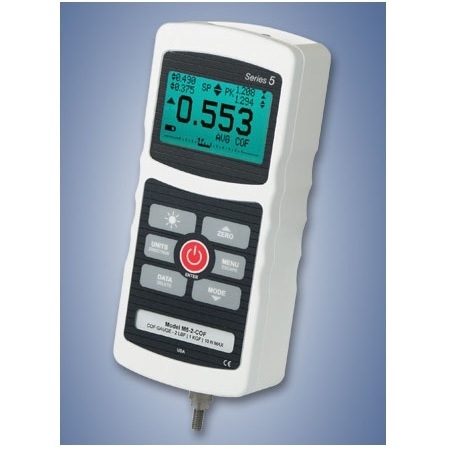 BG Digital Force GaugeProgrammable Digital Force Gauge with Output. Accuracy ± 0.2%. 11 Ranges up to 500 lbs. 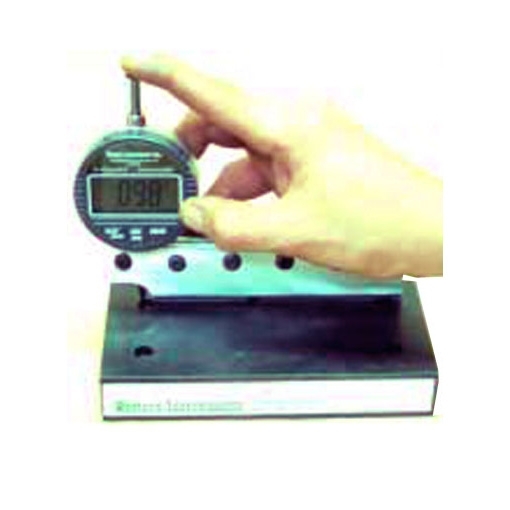 Measure force in lbs, Kgs or N. 3 Year Warranty. 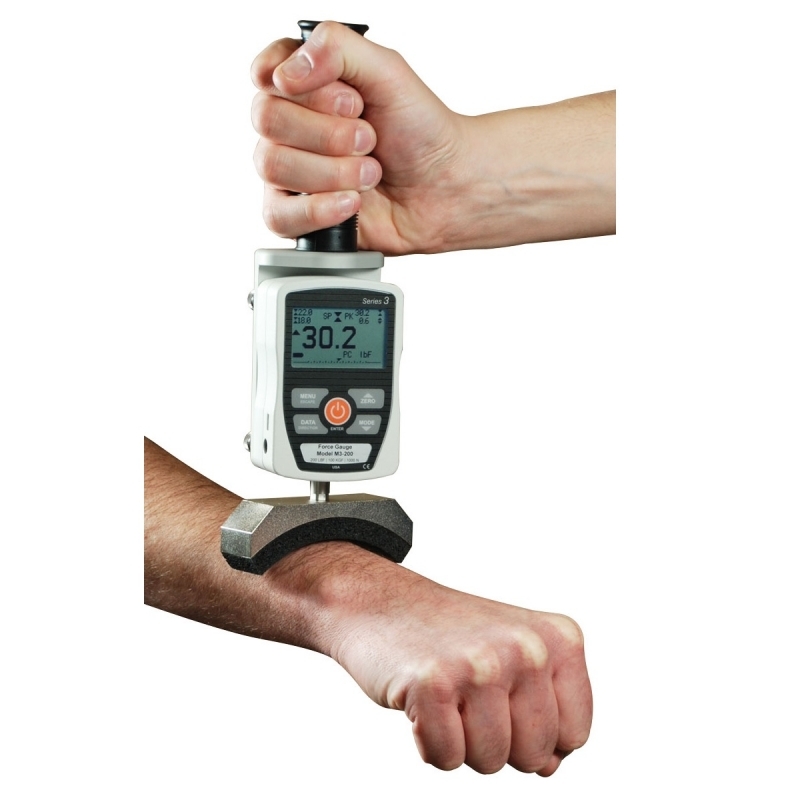 STH Universal Torque SensorUsed for general bi-directional torque testing applications requiring different sample sizes 6 Ranges up to 100 lb-in. 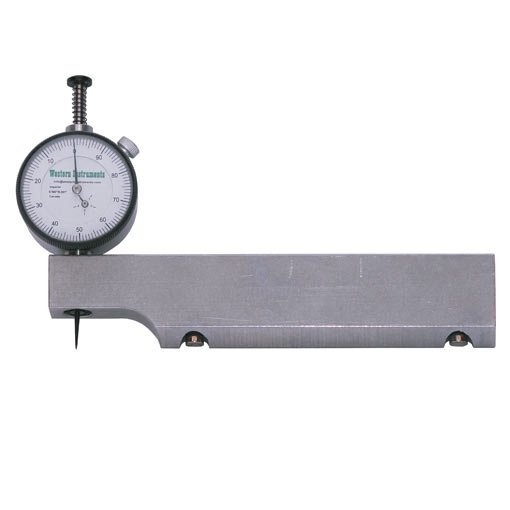 FB Mechanical Force Gauge25 Ranges up 100 lbs/50 Kg/500 N. Intrinsically Safe for use in hazardous environments. 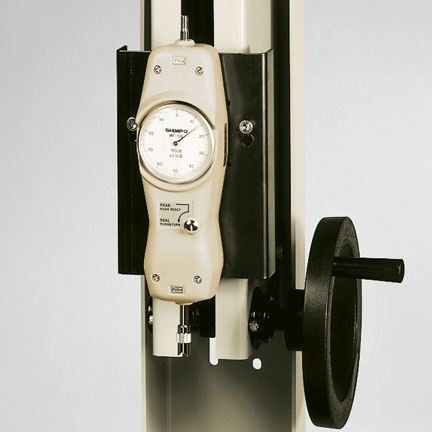 MF Mechanical Force GaugeMF mechanical force gauges are excellent for push/pull force testing in manufacturing, material testing, maintenance and inspection applications. 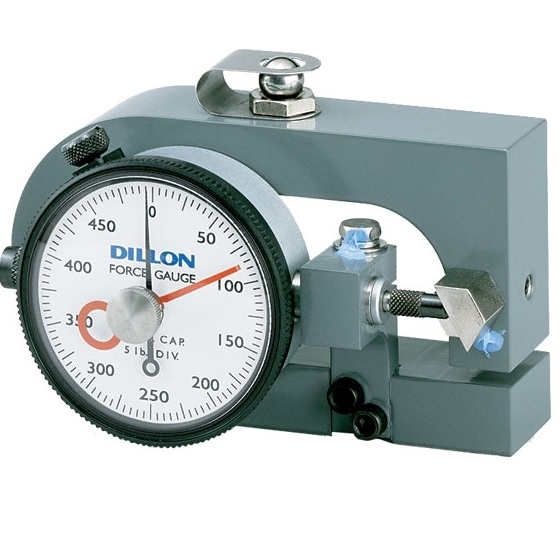 PS High Precision Mechanical Force Gauge25 Ranges up 100lbs / 50 Kg / 500 N. Intrinsically Safe for use in hazardous environments. 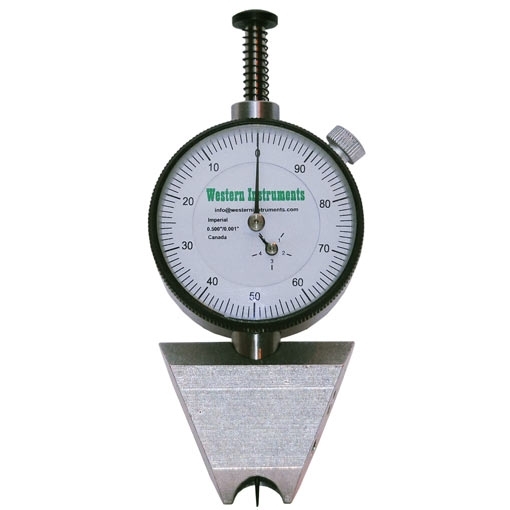 PSH Precision High Capacity Mechanical Force Gauge11 Ranges up 500lbs / 300 Kg / 3000 N. Intrinsically Safe for use in hazardous environments. Accuracy ± 0.3%. 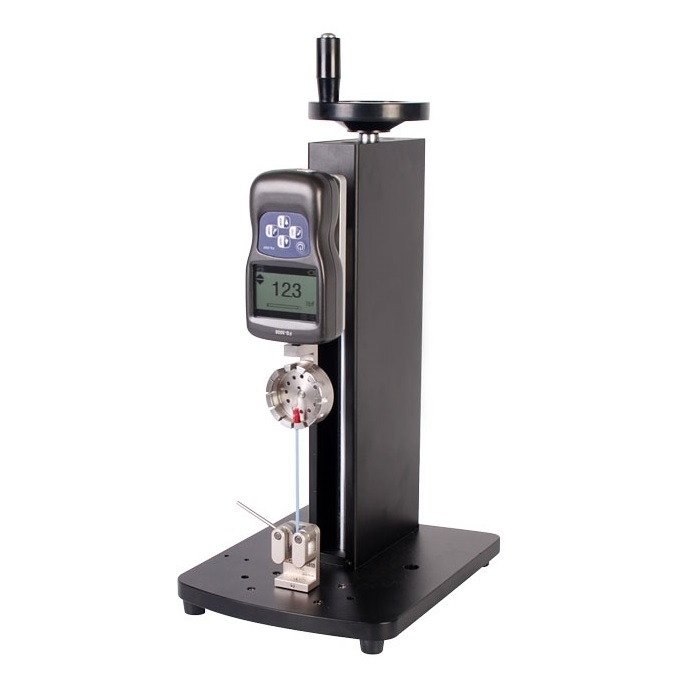 U-Force Slim-line Mechanical Force GaugeThe Model U Force Gauge is an accurate (±1% of full range) mechanical compression measurement instrument. 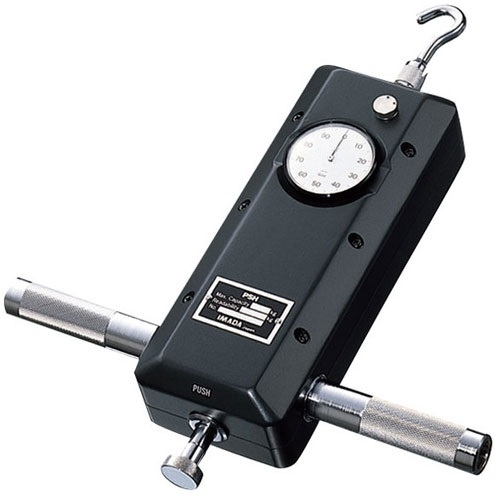 X-C Mechanical Force GaugeMechanical Force Guage with Hardened Ball. 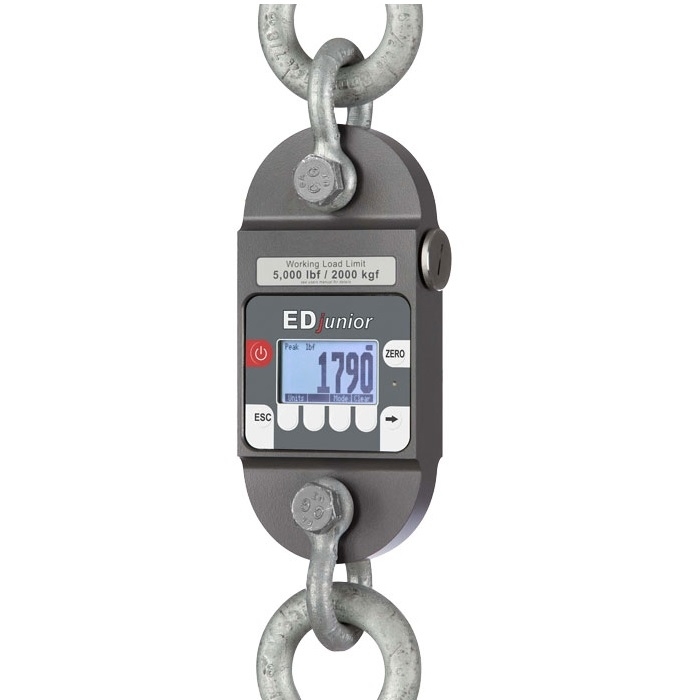 Available in capacities from 50 lb to 25,000 lb or 50 kg to 10,000 kg. ±1% accuracy of full range. 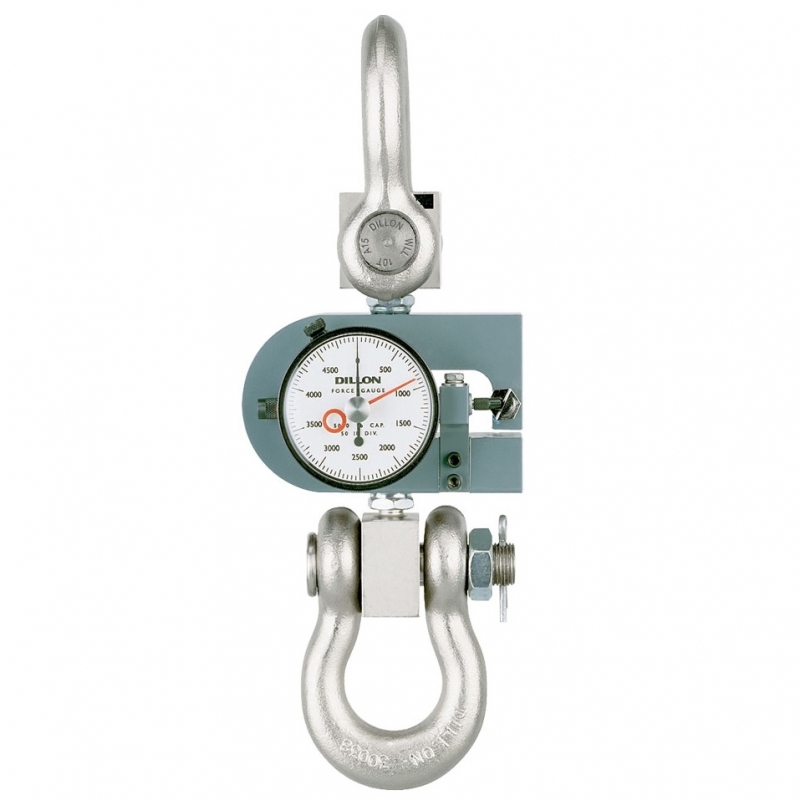 X-PP Tension and compression Force GaugeAvailable in capacities from 50 lb up to and including 2,500-0-2,500 lb or from 50 to 1,000 kg. Accuracy is ±2% of maximum dial reading. 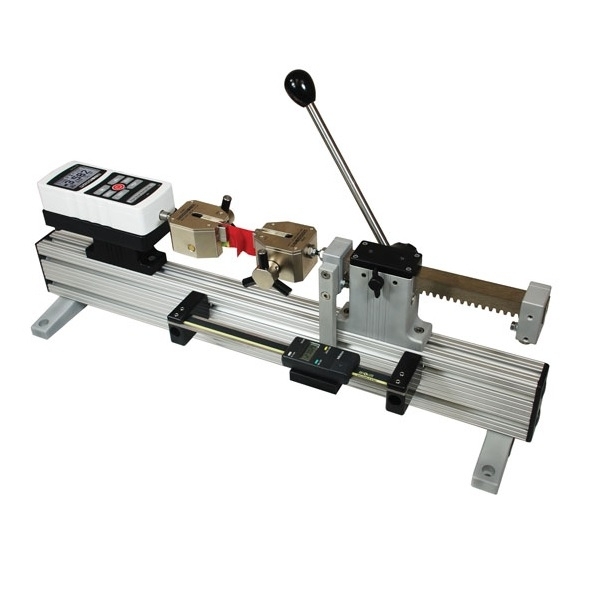 X-ST Mechanical Force GuageAvailable in capacities from 100 lb to 10,000 lb or 25 kg to 5000 kg. Accuracy is ±1%. 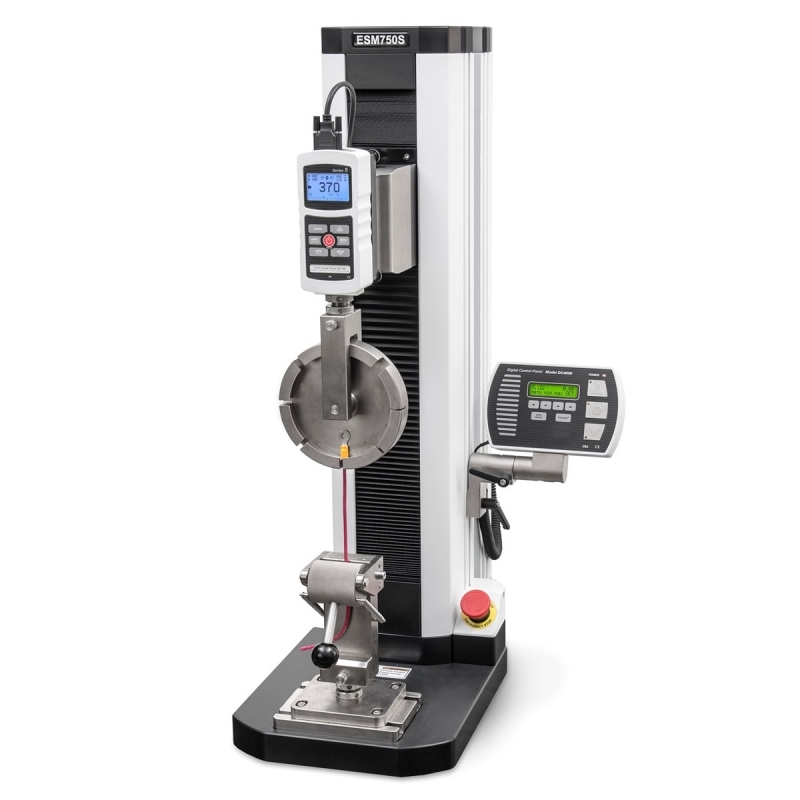 ES05 Manual Test StandTypical applications include switch contact activation testing, small spring testing, peel testing, and more. 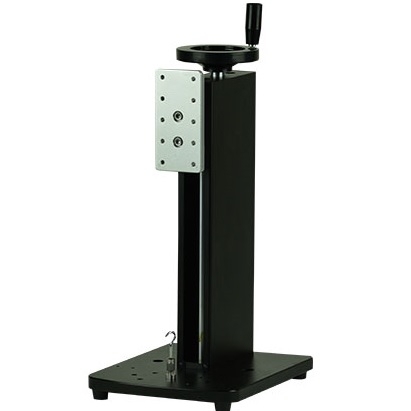 ES10 Mechanical Test StandThe new CHECK-LINE ES10 is a hand-lever operated manual test stand with a maximum capacity of 100lbs. 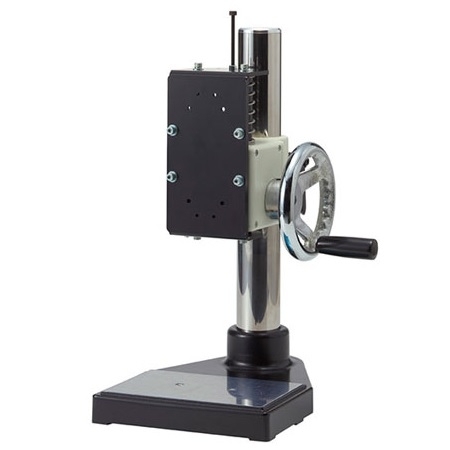 ES20 Mechanical Test StandManual Hand Wheel Operated Test Stand. 100lb Capacity. 9" Maximum Travel. ES30 Precision Hand Wheel Test StandPrecision Hand Wheel Test Stand. 200lb Capacity. 13" Maximum Travel. 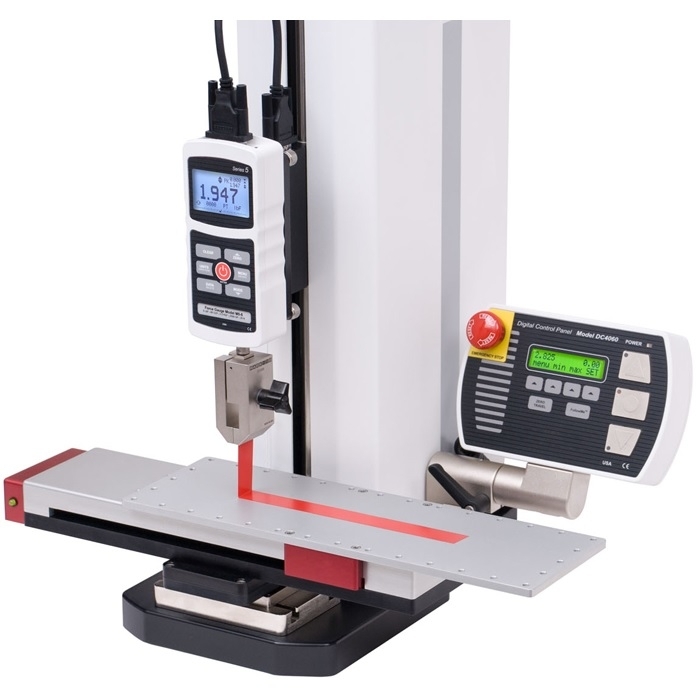 FGS-1000H Manual Test StandWith counter sunk (force gauge) mounting holes, a self aligning, pre-tapped sliding base plate for securely attaching test parts. 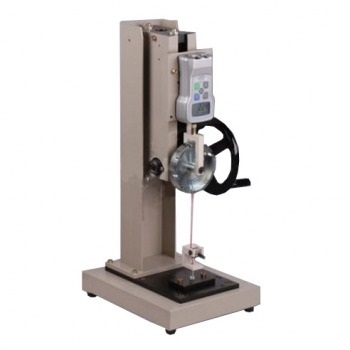 FGS-100H Manual Hand Wheel Operated Test StandManual Hand Wheel Test Stand. 110lb Capacity. 5.9" (150 mm) Maximum Travel. 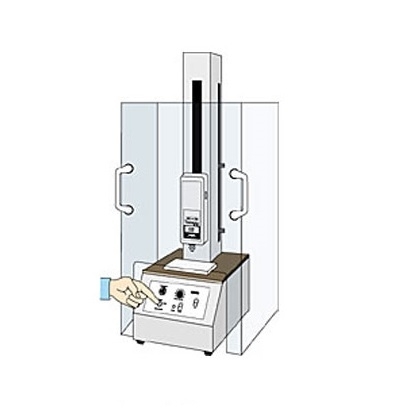 FGS-100L Manual Hand-lever Force Test StandTherefore they are perfectly suited for measuring a limitless range of materials such as, wire, spring, plastic, paper cord, tubing, glass and composites. 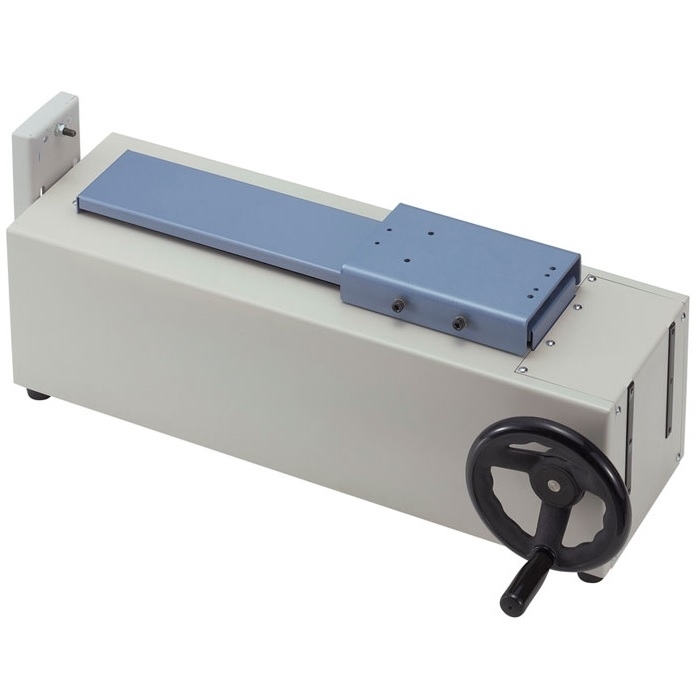 FGS-250W Manual Hand Wheel Operated Test StandManual Hand Wheel Operated Test Stand. 250 lb capacity. 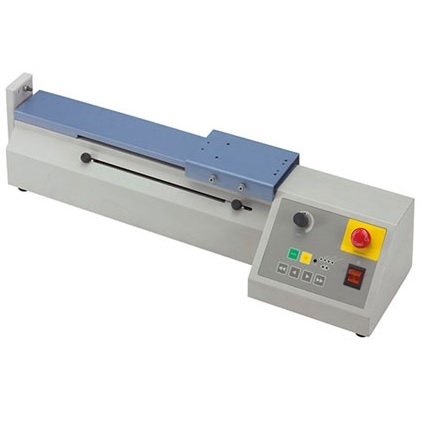 Able to be used in either the vertical or horizontal positions with no added equipment required. FGS-50S Manual Lever Test StandManual Lever Operated Test Stand. 50lb/22kg Capacity. 2"(50 mm)Maximum Travel. 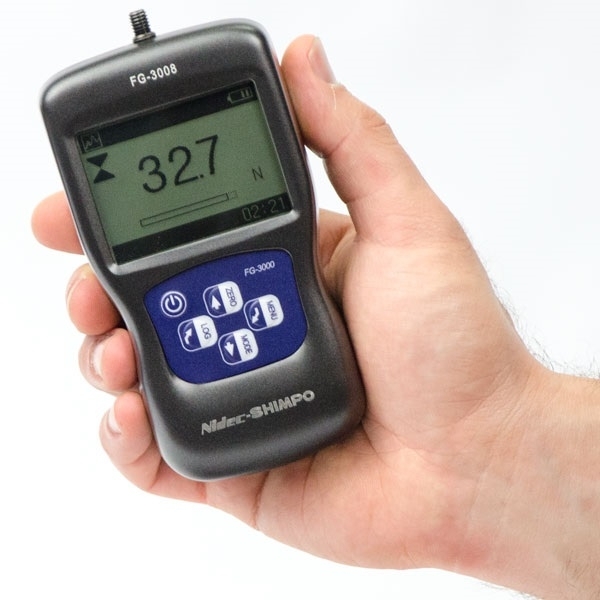 FSA-MSL Force / Displacement TesterIs designed for force vs distance measurement. 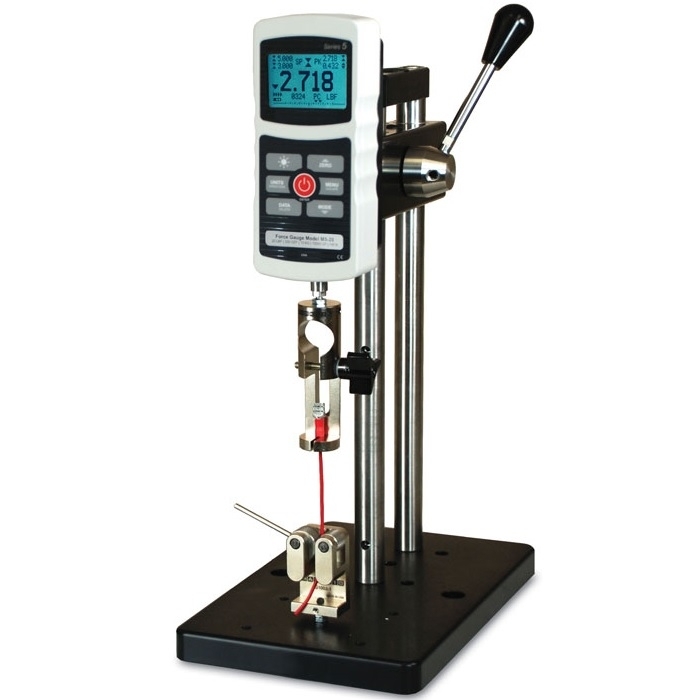 It is ideal for tests requiring very small movement, like switch tests 4 Ranges up to 11 lbs/5 Kg/50 N Capacity. 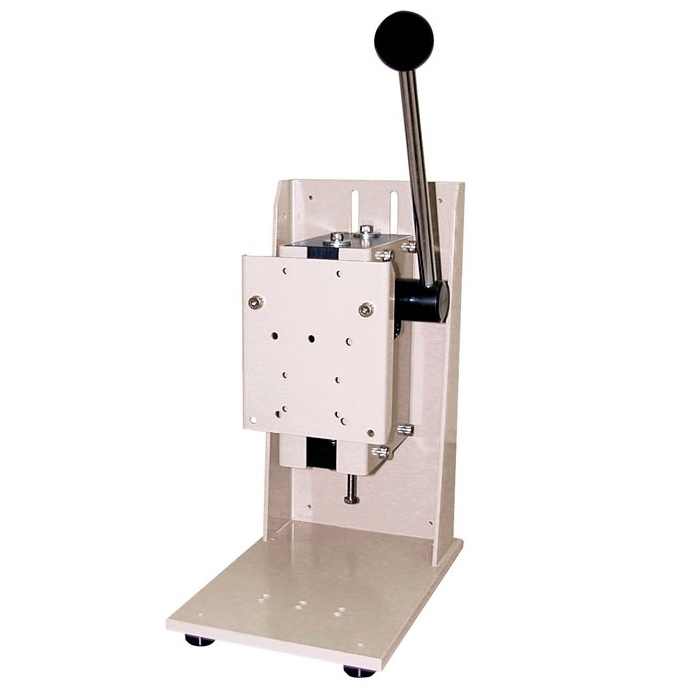 HV-300/500 High Capacity Precision Hand Wheel Test StandHigh Capacity Manual Hand Wheel Test Stand. 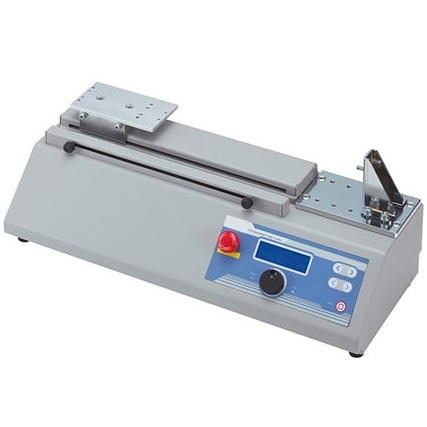 Ranges Up to: 0-500 lbs / 0-250 Kg / 0-2500N 12" (300mm) Maximum Travel. 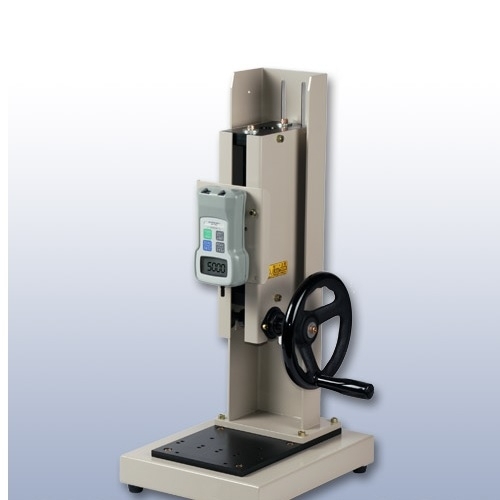 HV-Series Manual Hand-Wheel Force Test StandManual Hand Wheel Test Stand Optional Distance Meter, 110lb Capacity HV-110, 220lb Capacity HV-220, 9" Maximum Travel, 16.5" Clearance (optional). 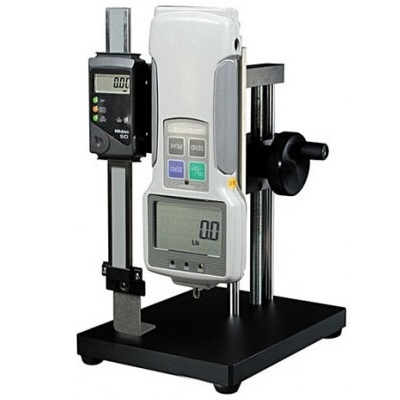 KV-11-S Micro Movement Test StandHand Wheel Test Stand For compression tests only. Maximum Load 11 lbf (5 kgf). 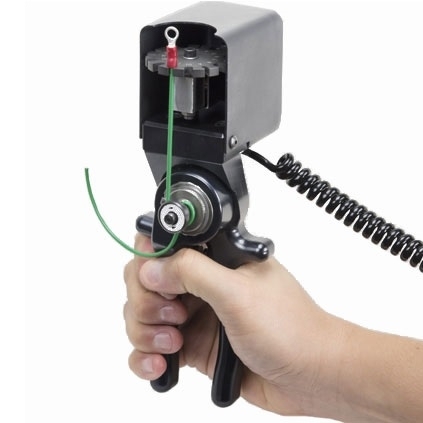 LH Horizontal Wire Terminal Pull TesterThe LH horizontal, straight-pull, wire terminal testers are designed specifically to test the pull-off force of wire terminal connectors and includes gripping attachments. NLV-220 Vertical Lever Test StandVertical Lever Test Stand. 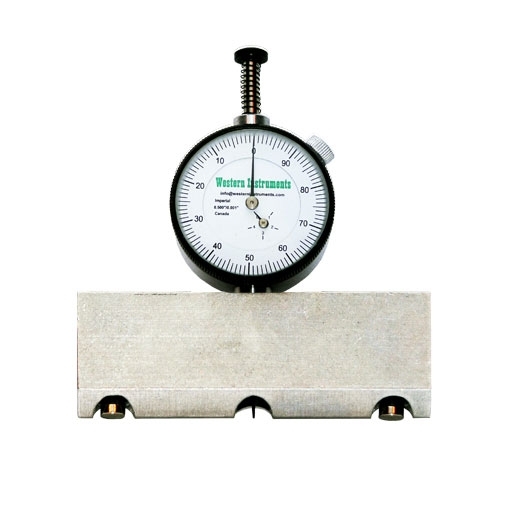 2 Models for testing Tension or Compression. 220 Lb Capacity. 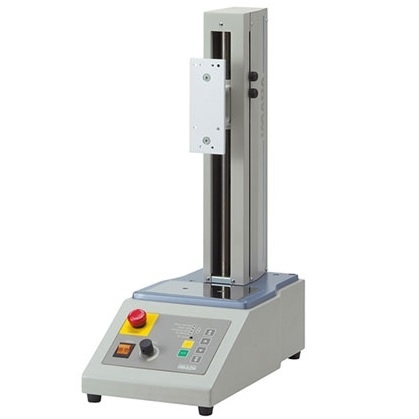 SH-220 Horizontal Hand Wheel Test StandThe SH-220 horizontal test stand is ideal for doing peel tests and other force measurements where a horizontal test stand is required. SVH-220 Vertical Hand Wheel Test StandTravel: 3mm per wheel rotation. 220 Lb Capacity. SVL-220 Manual Lever Test StandEasy to change from tension to compression mode. 220 Lb Capacity. 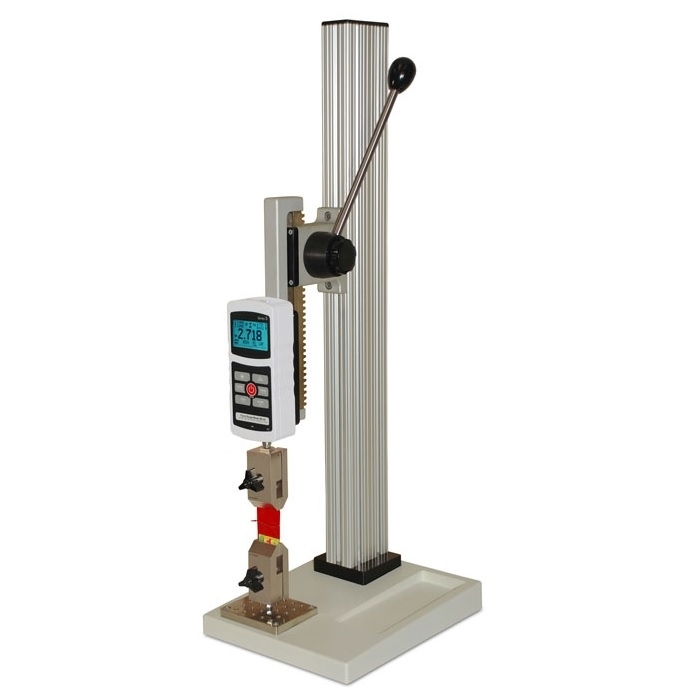 TSA750 Lever Operated Force Gauge Test StandThe lever operated Force Measurement Test Stand Model TSA750 is a perfect solution for quick-action pull testing and compression testing of up to 750 lb of tensile or compressive force. TSB100 Manual Test StandManual Lever Operated Test Stand. 100 lb Capacity. 6" (152 mm) Maximum Travel. 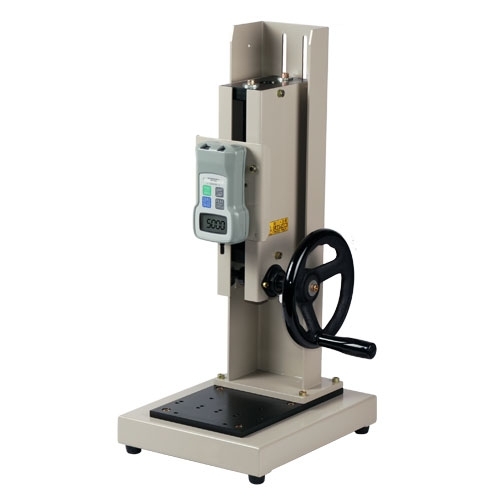 TSC1000 High Capacity Test StandEconomical High Capacity Manual Hand Wheel Test Stand. 1,000lb Capacity. 3.5" (89mm) Maximum Travel. 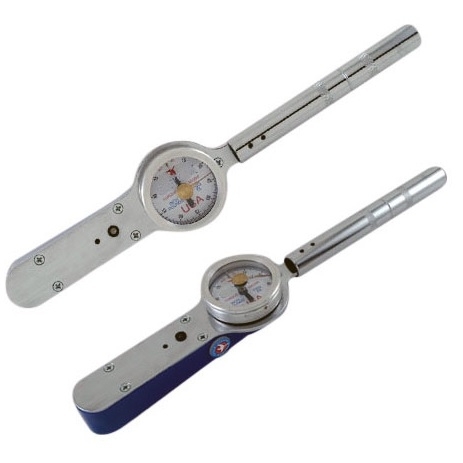 TS-Series Dial Torque WrenchRigid Frame Dial Type Torque Wrench. Capacities from 600 in-lbs to 600 ft-lbs. 1/4, 3/8, 1/2 or 3/4 Inch Drive. 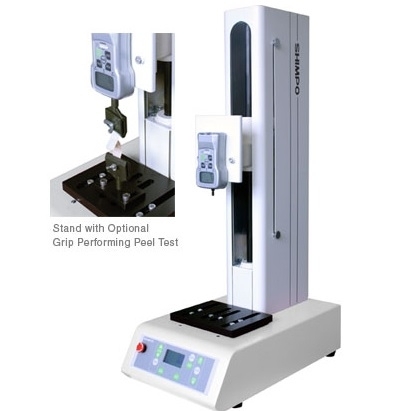 EMX-275 Motorized Test StandUltra Precision, Force Control, Motorized Test Stand. Easy-to-use program dial and menu screens control distance, mode, speed, time and cycles. 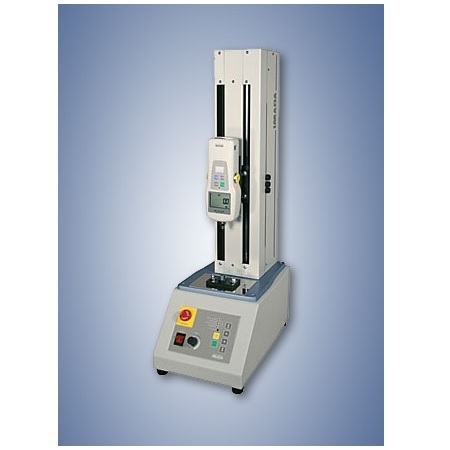 ESM1500 High Capacity Motorized Test StandMotorized Test Stand with 1,500 lbF (6.7 kN) Capacity. 14.2" or 32" of travel. PC control, stop / cycle at force, travel, or limit switch. Overload protection. 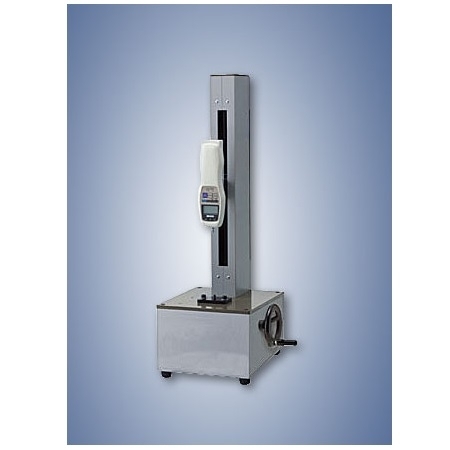 ESM303 High Performance Motorized Test StandMotorized Test Stand with 300 lb Capacity, 18" of travel. 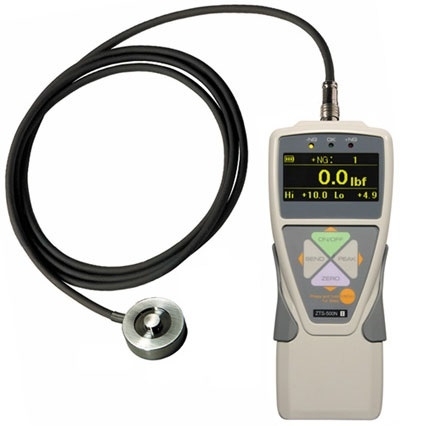 Distance Measurement, Break Detection, Load Holding and many other features. Made in the USA, 3 Year Warranty. ESM303-003 Safety Shield For ESM303 Test StandThe ESM303-003 safety shield attaches to an ESM303 test stand, providing pinch and sample debris protection for the operator. 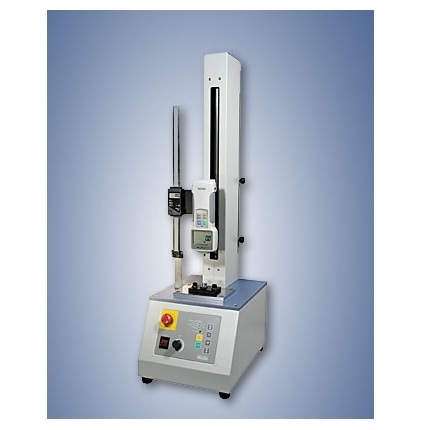 ESM750 High Capacity Motorized Test StandMotorized Test Stand with 750 lbF (3.4 kN) Capacity. 14.2" or 32" of travel. PC control, stop / cycle at force, travel, or limit switch. Overload protection. 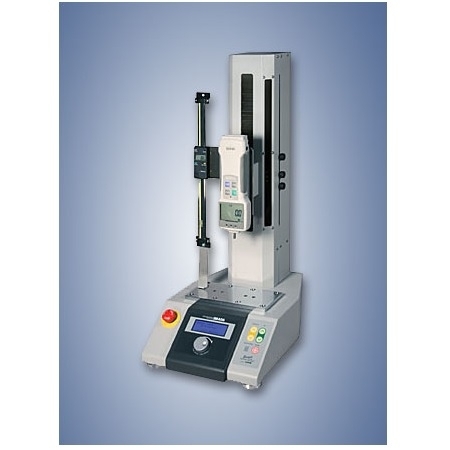 FGS-100E Motorized Force Test StandVertical Motorized Force Test Stand. 110 lbs capacity. 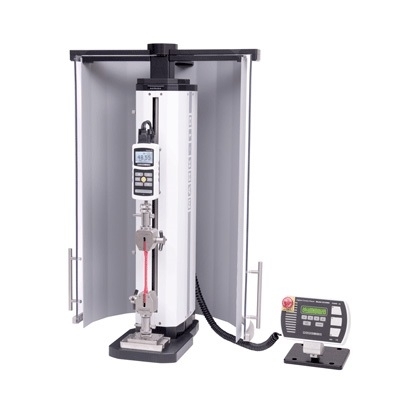 FGS-100PV Motorized Programmable Force Test StandTheir all steel construction makes them remarkably rugged while performing with precision. Programming capabilities provide the versatility to tackle a multitude of applications. 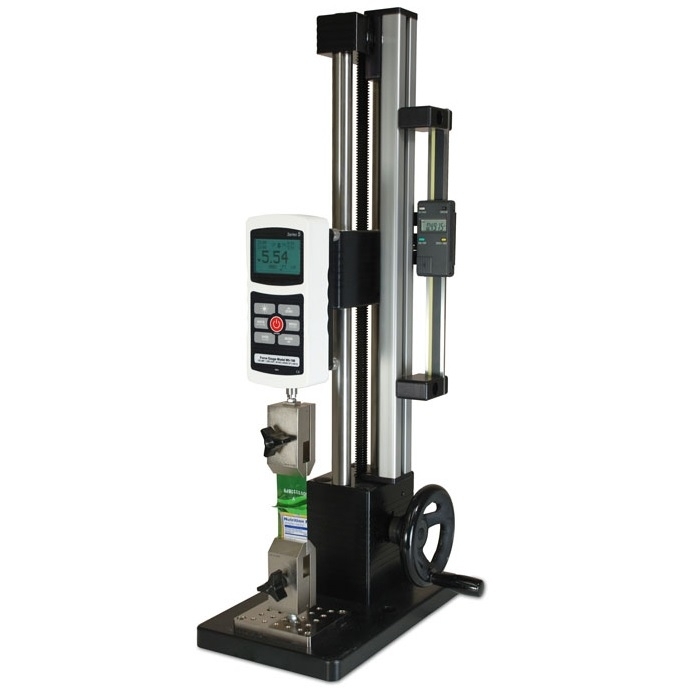 FGS-100PX Motorized Programmable Force Test StandProgrammable force test stand combined with our line of top quality force gauges; provide a complete force measurement system capable of handling the most precise testing applications. 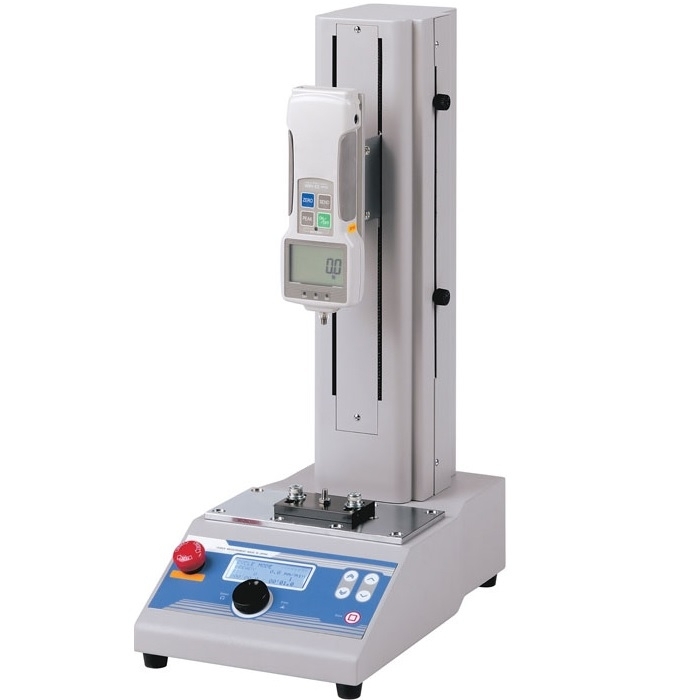 FGS-220VC Motorized Force Test StandMotorized Force Test Stands with PC Control & Data Logging. Capacity: 220 lb (100kg ,1000N). 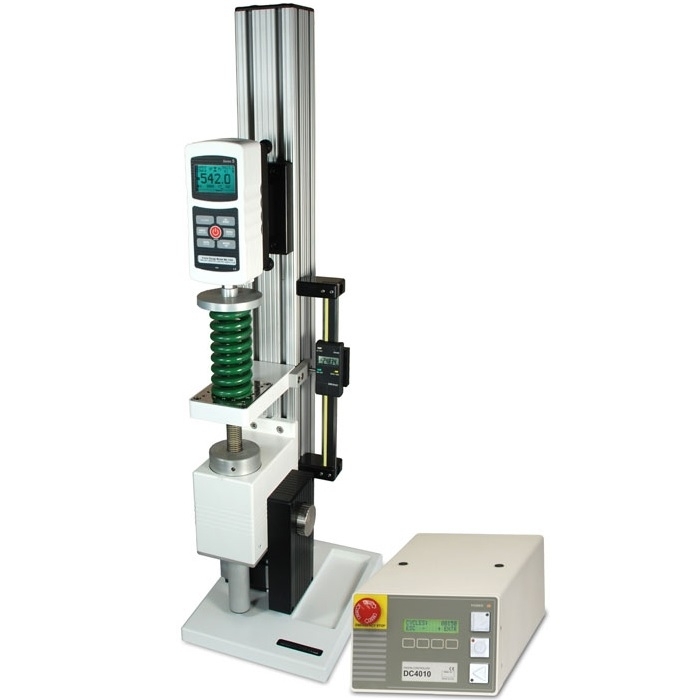 MH-275 Motorized Horizontal Test StandThe new MH-275 motorized test stand is designed for tension, compression, and friction testing. 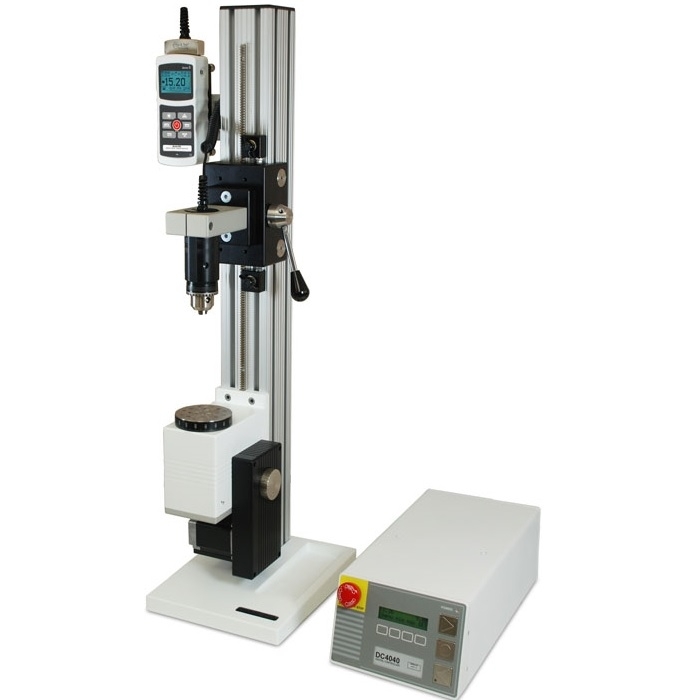 MH-500 Motorized Horizontal Test StandOur Basic or Auto Cycle models are available in Standard, High, and Low speeds. Speed control, quick return and emergency stop are standard features. 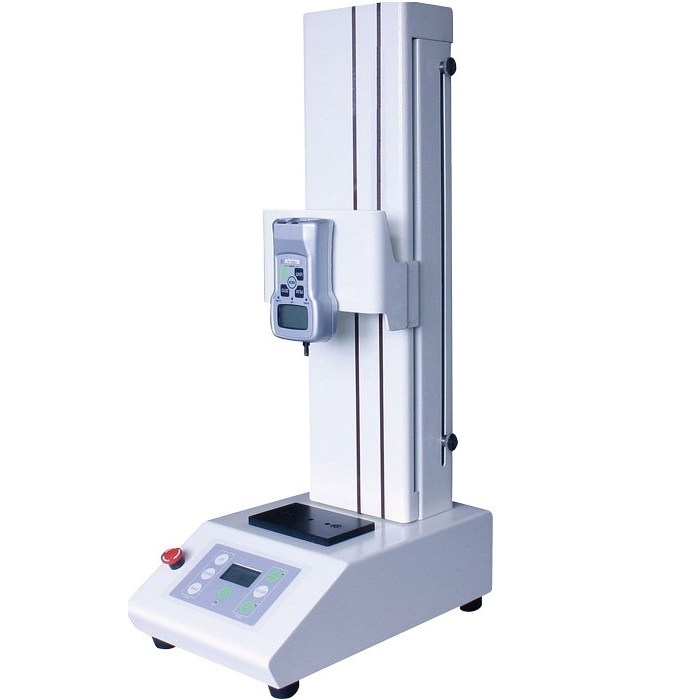 MH2-110 High Performance Horizontal Motorized Test StandHigh Performance Force Control Motorized Test Stand. 110 lb Capacity. Stroke: 9" (230mm). 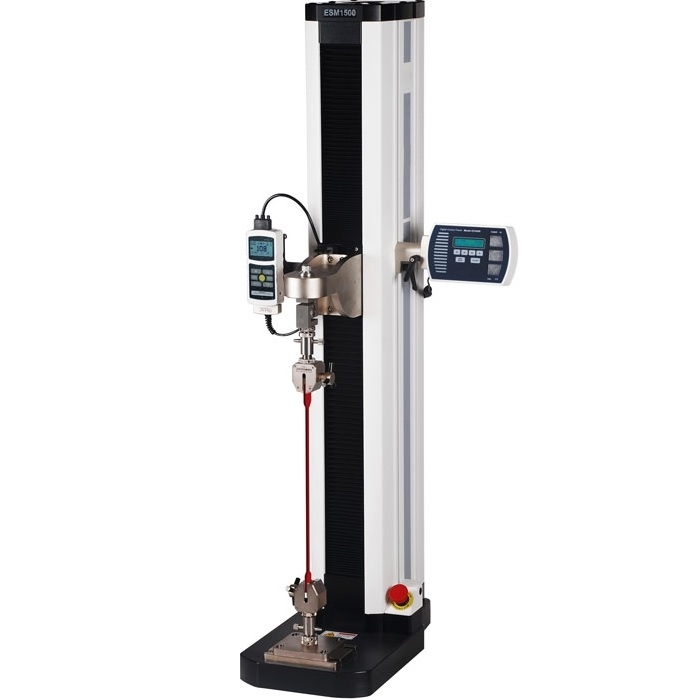 MX-110 Motorized Vertical Test Stand4 speed ranges: 0.4 – 11.5 in/min, 0.08 ~ 2.3 in/min ("-O"), 0.8 - 23.0 in/min ("-F"), 1.6 - 47.0 in/min ("-WF"). 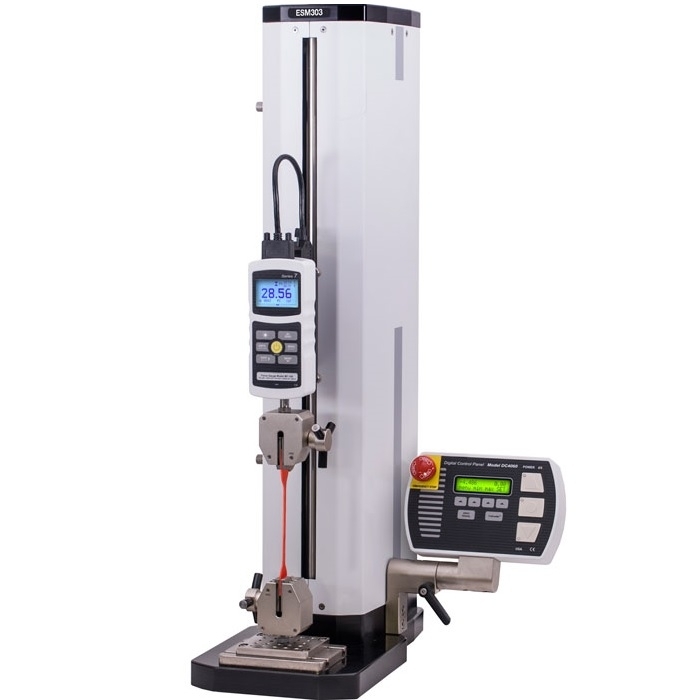 MX-1100 Motorized Vertical Test StandCombination of ball screw drive system and high performance brushless motor provides extremely smooth and powerful operation over the entire speed range. 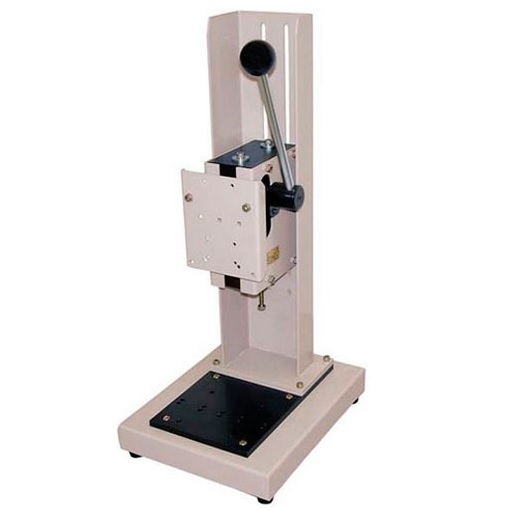 MX-275 Motorized Vertical Test StandOne stand for both compression (push) and tension (pull) tests. Jog, Single Cycle, Continuous Cycle (72 hour max. ), Force Control. 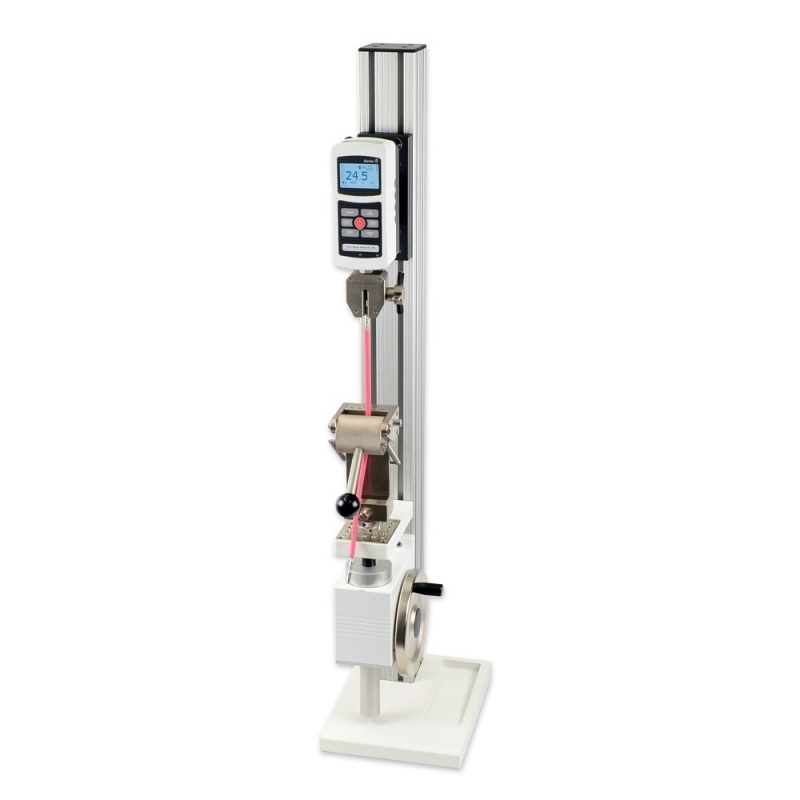 MX2 High Performance Motorized Test StandMX2-110-110 lbs/50 Kg/500 N, MX2-275-275 lbs/125 Kg/1250 N, MX2-550-550 lbs/250 Kg/2500 N. High Performance, Force Control, Motorized Test Stand with Speed Control, Timer & Cycle Counter. 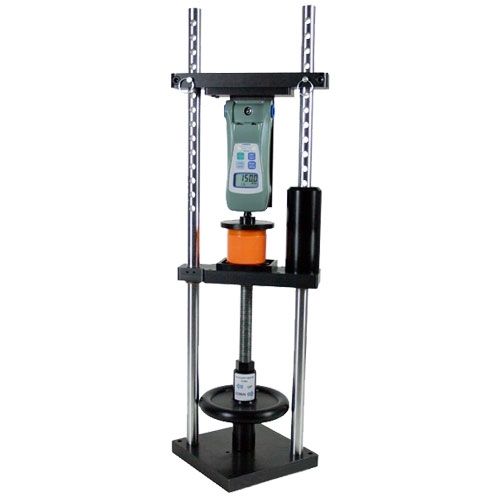 TSFM500-DC High Capacity Advanced Motorized Test StandProgrammable Test Stand. 500 Capacity. 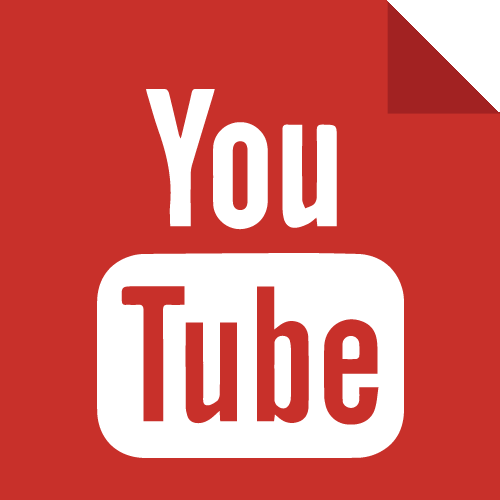 PC control, stop / cycle at force, travel, or limit switch. 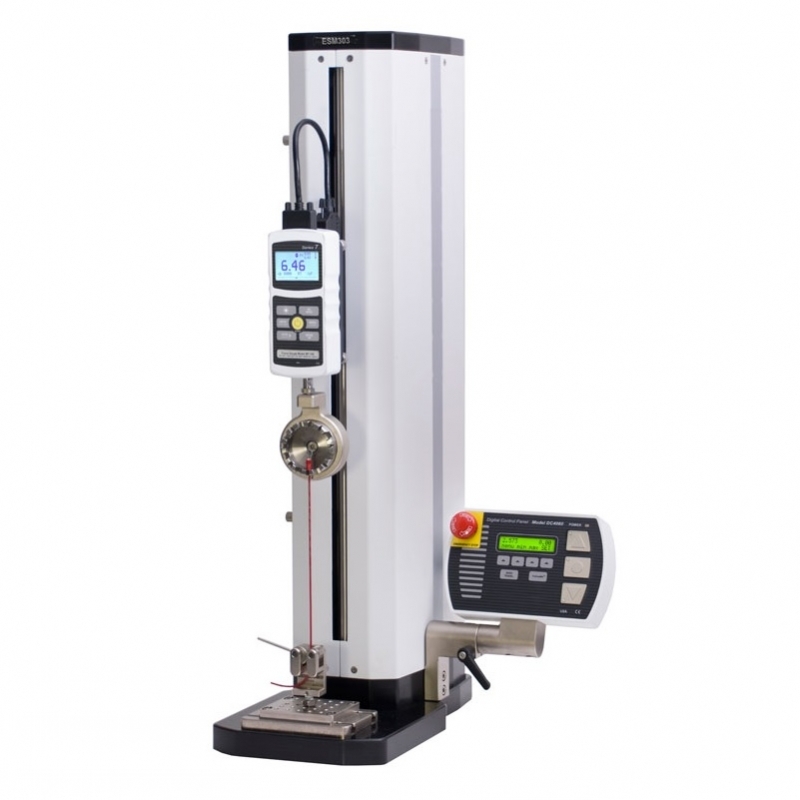 TSTM-DC Advanced Motorized Torque Test StandThe TSTM-DC Advanced Motorized Torque Test Stand offers all the mechanical specifications of the TSTM motorized test stand. 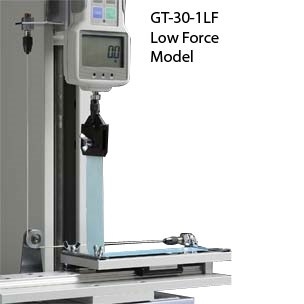 GT-30-1 90 Degree Peel Test Fixture90° Peel Test Fixture. Maintains constant 90° angle during pull test. 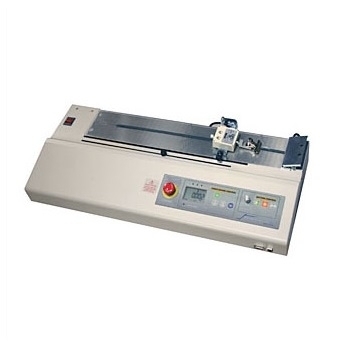 IPT-200 Embossed Carrier Tape Peel TesterEmbossed Carrier Tape Peel Tester. 180° peel for embossed carrier tape. Stroke: 15.74" (400mm). 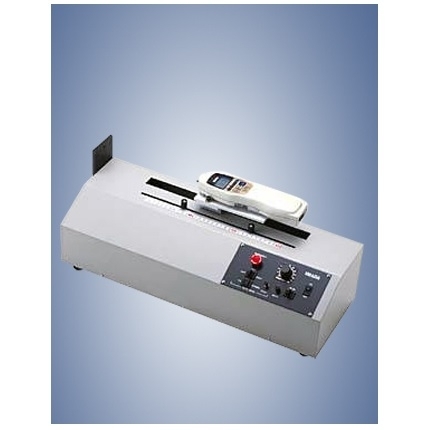 P45-50N 45 Degree Peel TesterPeeling strength of a film cover of plastic container. For food and medical care etc. Digital Physical Therapy KitsPhysical Therapy Kits for testing muscle strength and ergonomic force. Ranges from 100 to 500 lbs (50 to 250 kg). 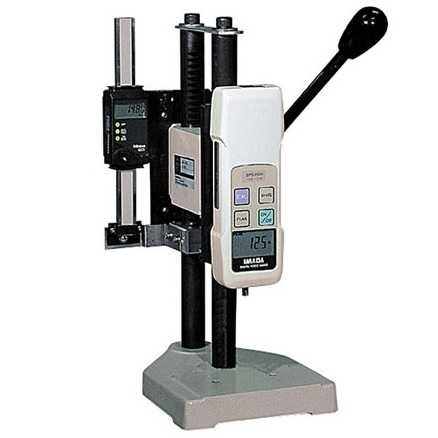 EK3 Ergonomic Testing KitAdvanced test kit with USB output for testing muscle strength, job task analysis, and more Available in 200 lb and 500 lb capacities. Mechanical Physical Therapy KitsPhysical Therapy Kits for testing muscle strength and ergonomic force. 100 lb (50 kg) capacity. 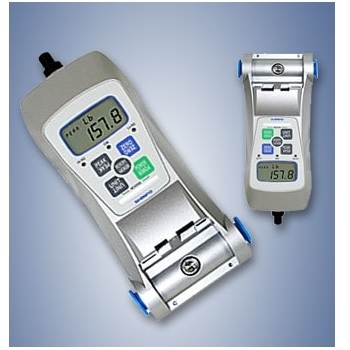 Series-E Ergonomics Force GaugeDigital Force Gauge with USB Output for ergonomics analysis. 3 Capacities up to 500 lbF. 7,000 Hz peak sampling rate. ±0.2% accuracy. 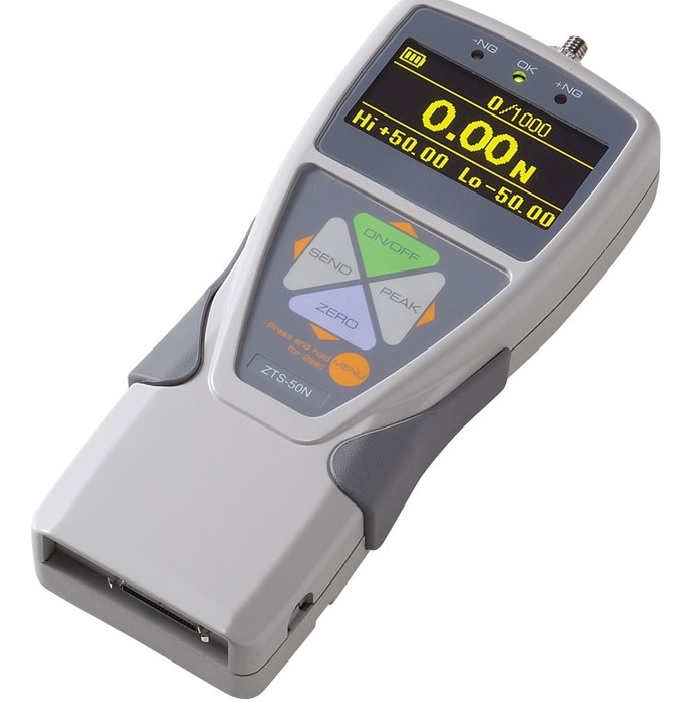 FG-7000 Digital Force GaugeDigital Force gauge with USB Output. 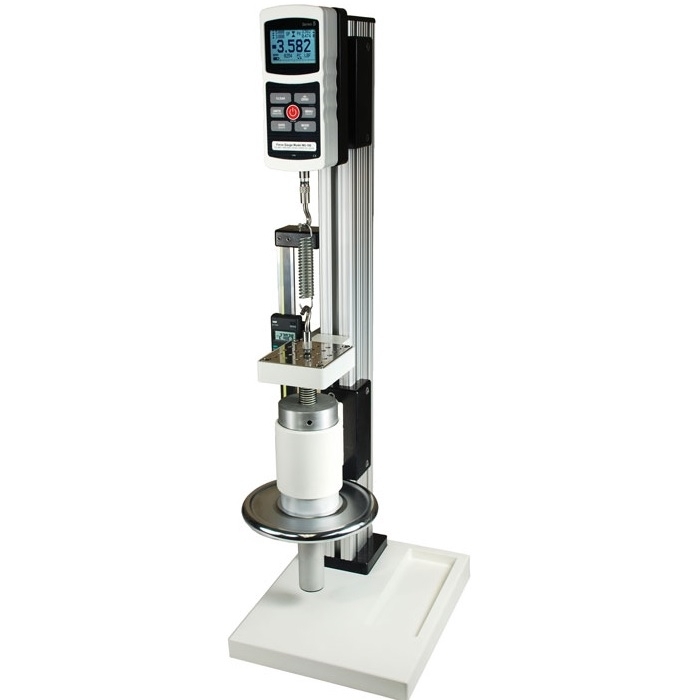 Capacities up to 220 lbs/100 Kg/1000 N. ±0.2% accuracy. 1000 data point memory. 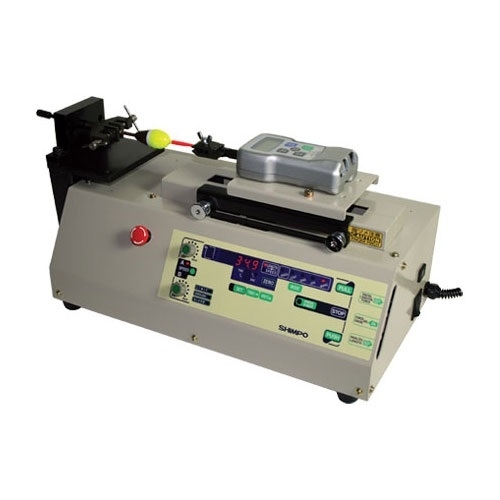 WT3-201 Wire Pull TesterManual Wire Pull Tester. 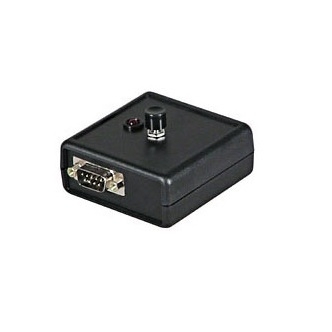 USB, RS-232, Analog outputs. 200 lb, 100 kg , 1000 N Capacity. Made in the USA. 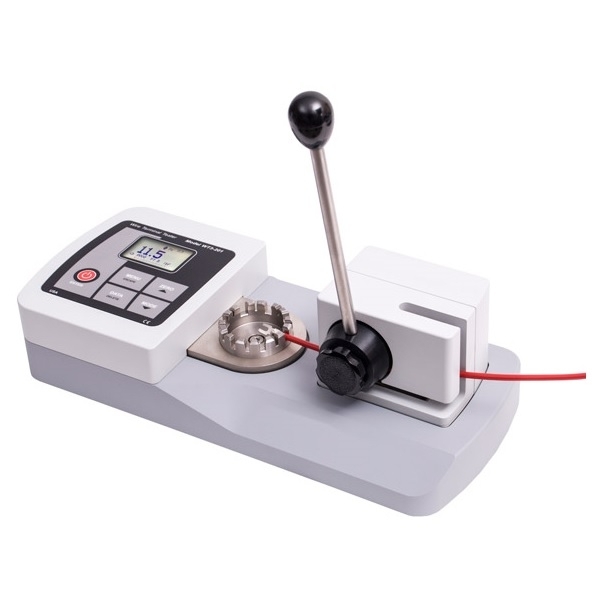 WTT Manual Wire Terminal Pull TesterManual Wire Terminal Pull Tester. Capacity 220 lbs / 100 kg / 1000 N.
WTT-ESM Motorized Wire Terminal TesterMotorized Wire Terminal Tester with Programmable Force Control. Range: 0-200 lbs/0-100 Kg/0-1000N. 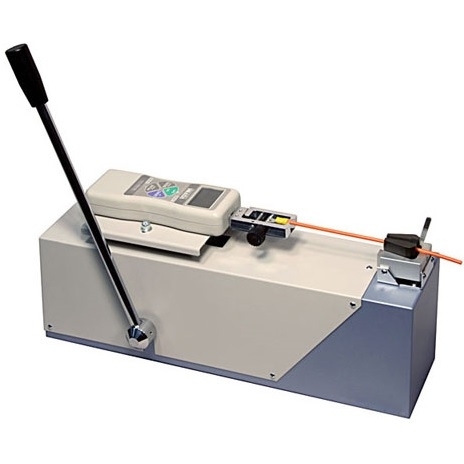 WTT-ESMHD High Capacity Motorized Wire Terminal Test SystemAvailable in 750 or 1500 lb capacity, the WTT-ESMHD includes a slotted wire terminal fixture accommodating wires up 0000 AWG (4/0) (.46" / 11.8mm diameter). WTT-FGS Wire Terminal TesterWire Terminal Tester. Range: 0-110 lbs / 0-50 Kg / 0-500N. Measures in "Continuous" or "Peak" mode. WTT-HD Heavy Duty Wire Terminal TesterWire Terminal Tester Pull Tester. Range: 0-220 lbs / 0-100 Kg / 0-1000N. Measures in "Continuous" or "Peak" mode. 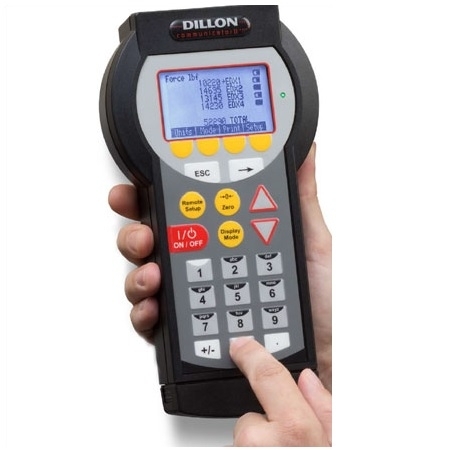 DLM-107A Digital Length MeterThe Model DLM-107 Digital Length Meter is designed to accurately measure fabric length (or other moving belt material), in feet or meters. 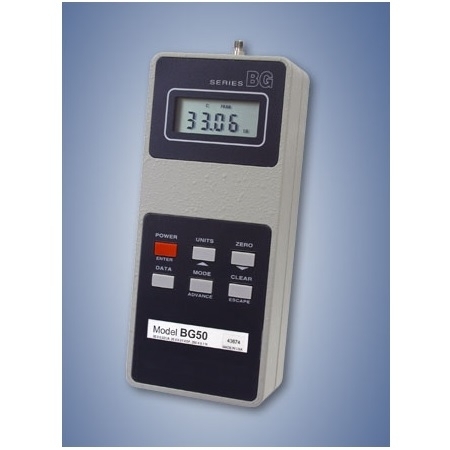 BCS Electronic Crane ScaleThe BCS electronic crane scale is a precision scale for a wide range of industrial weighing applications. 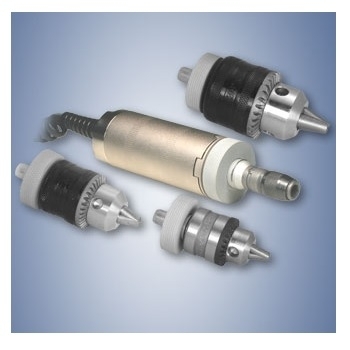 The BCS is available in 3 ranges with capacities up to 10,000 lb/5,000kg. 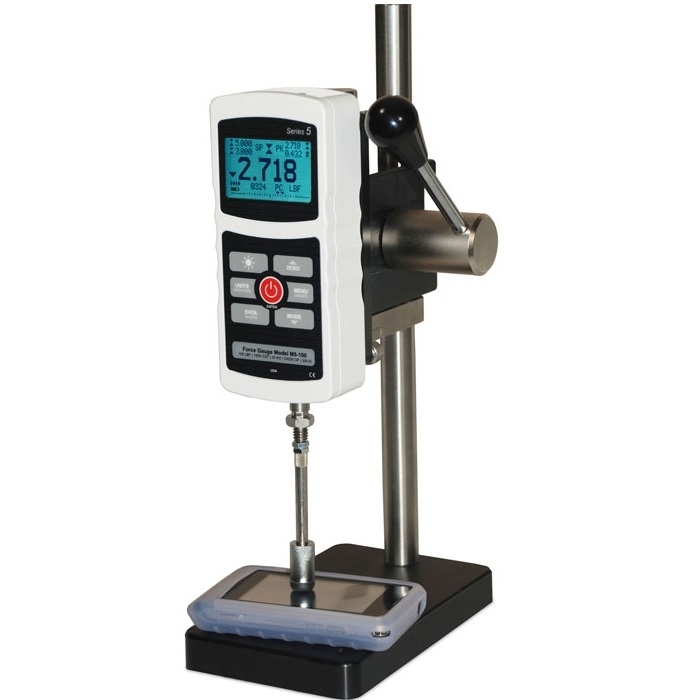 DPG-2 Digital Pit GaugeThe DPG-2 is easy-to-use and provides fast and accurate measurements of surface pits, gauges, dents, undercut, etc. DPG-3 Enhanced Digital Pit Depth GaugeThe DPG-3 is easy-to-use and provides fast and accurate measurements of surface pits, gauges, dents, undercut, etc. 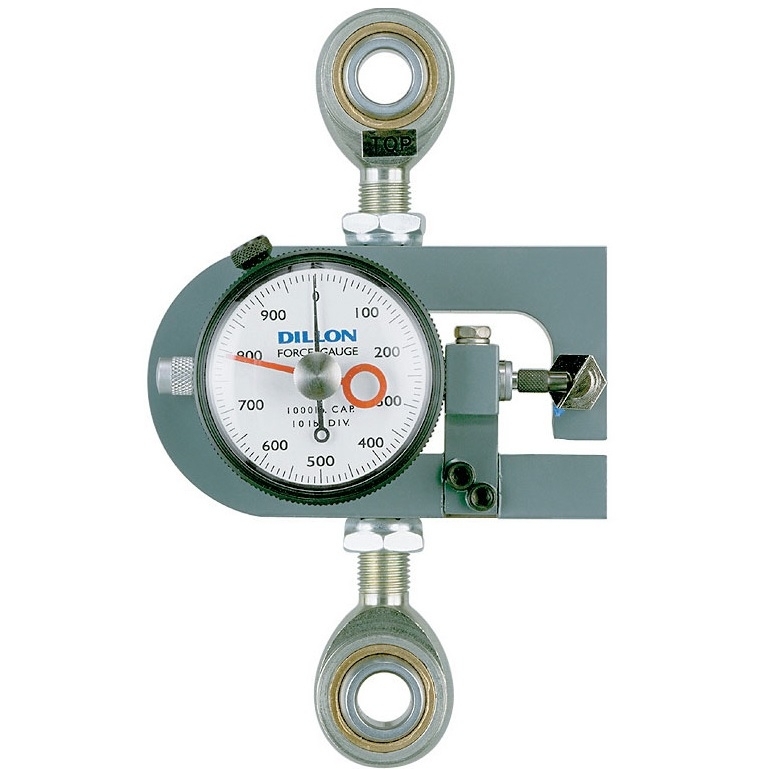 N88-12 Reference Pit GaugeN88-12 Reference Pit Gauges with Dial or Digital Indicators. 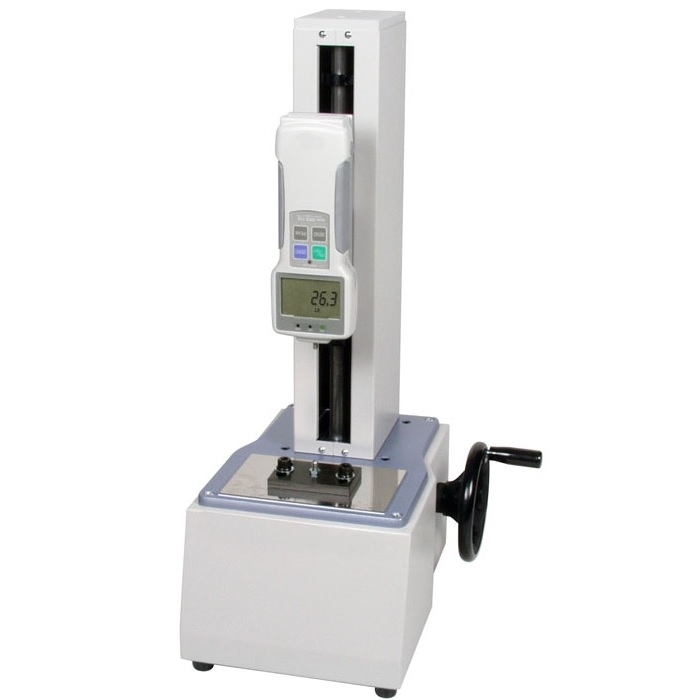 Measuring Ranges x Resolution: 14 x 0.01 mm or 0.550 inch x 0.001 inch). 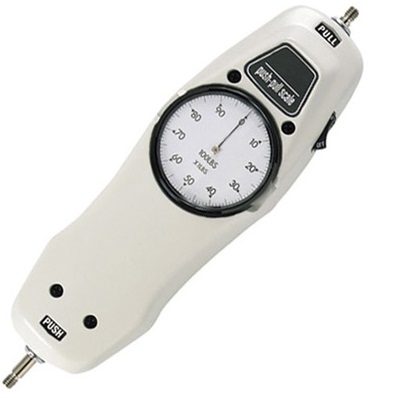 N88-2 Basic Pit GaugeMeasuring Range x Resolution: 14 x 0.01 mm, 0.550 x 0.001 inch. Center-mount 2.25 inch (57 mm) Blade. 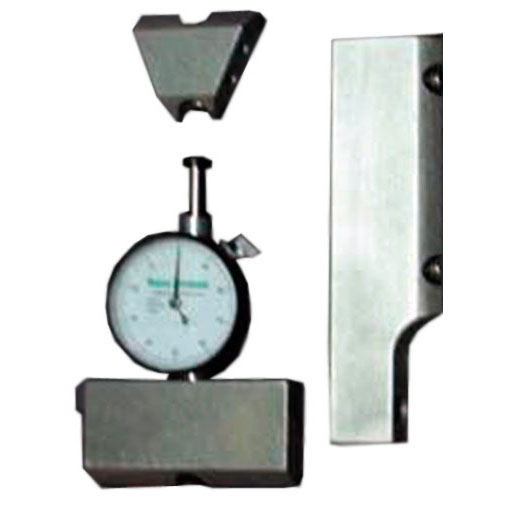 N88-3 Basic Plus Pit GaugeMeasuring Ranges x Resolution: 14mm x 0.01mm, 0.550 x 0.001 inch. Center-mount 3.25 inch (82 mm) Blade. 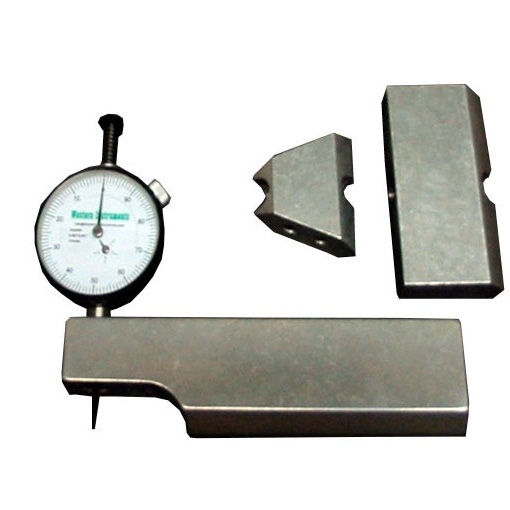 N88-3M Basic Plus Magnetic Pit GaugeMeasuring Ranges x Resolution: 14mm x 0.01mm, 0.550 x 0.001 inch. Centre Mount c/w Two magnetic cartridges 3.25 inch Blade. 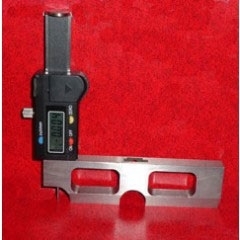 N88-4 Pocket Pit GaugeMeasuring Ranges x Resolution: 14 x 0.01 mm, 0.550 x 0.001 inch. Dual Edge Blade (Reversible), 1.5 inch (38 mm) long and spot bade. 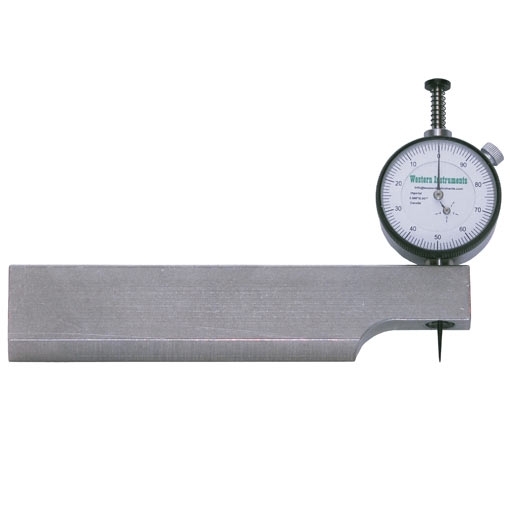 N88-5 Pit Gauge4.75 inch (121 mm) wide Blade, End-mount with Long Nose Cutout. Measuring Ranges x Resolution: 14 x 0.01mm, 0.550 x 0.001 inch. 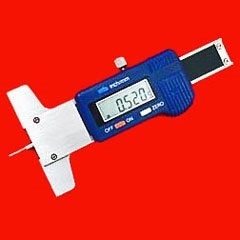 N88-6 Reaching Plus Pit GaugeMeasuring Ranges x Resolution: 14 mm x 0.01mm, 0.550 x 0.001 inch. 6 inch (152 mm) Blade, End-mount with Long Nose Cutout. 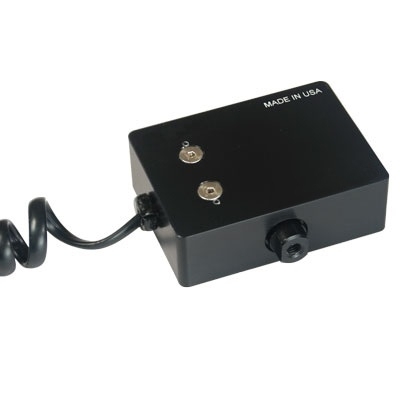 N88-6M Reaching Plus Magnetic Pit GaugeMeasuring Ranges x Resolution: 14 x 0.01mm, 0.550 x 0.001 inch. 6 (152 mm) Blade, End-mount with Two (2) Adjustable Magnetic Cartridges. 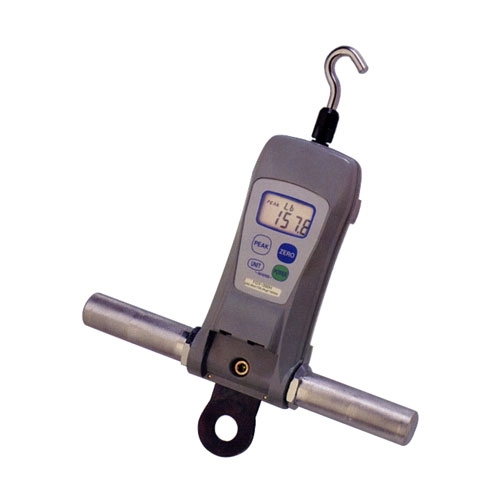 N88-9B-D Digital Pipe Pit GaugeThe N88-9B-D Digital Pipe Pit Gauge evolved from specific customer requests. N88-FBH Pit Gauge Calibration BlockN88-FBH Pit Gauge Calibration Block. N88-TF Reaching Pit GaugeThe N88-TF Tank Floor Reaching Pit Gauge and Extension Tube is delivered as a Kit. 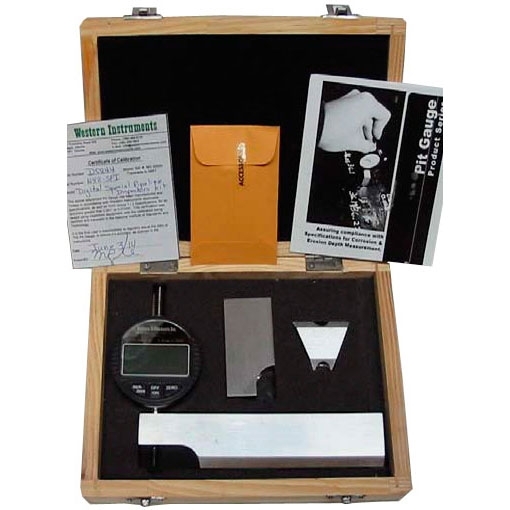 PCWI-0917-0923 Digital Pit Gauges0917 & 0923 Digital Pit & Crack Depth Gauges. 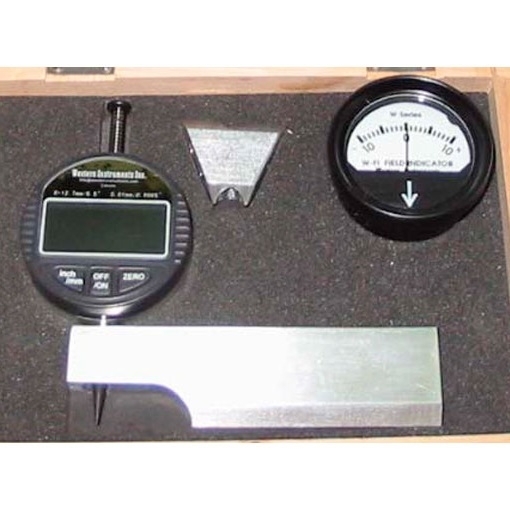 Digital Pit, Crack & Corrosion Depth Gauges / Pipe Pit Gauges. N88-CI Cylinder Inspectors KitThese Gas Cylinders require regular inspections and re-certification, which includes measurement of Pits, Gauges, and abrasion. N88-IS Inspectors KitWe offered the Pipeline Inspectors Kit. 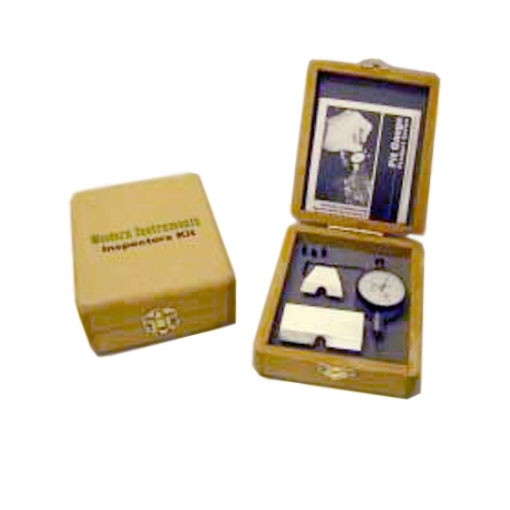 We now offer Kits for Aircraft and Bridge Inspectors through our Inspectors Kit. N88-MI Marine Inspectors KitMarine Inspectors Kit (N88-MI). N88-PI Pipeline Inspectors KitN88-PI Pipeline Inspectors Kit-includes Reaching Plus Blade N88-6B, the Pocket Reversible Blade N88-4B and the Basic Blade N88-2B. 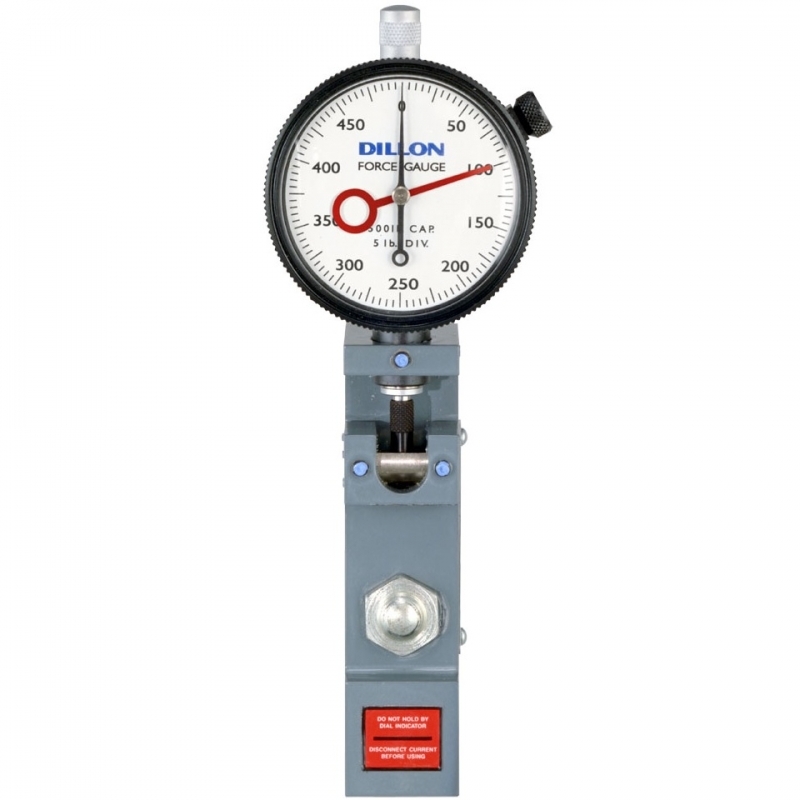 N88-PW-D Pipeline Weld Supervisors KitThe Reaching Pit Gauge is used to measure weld undercut, end alignment differences across the weld as well as Mill Marks. 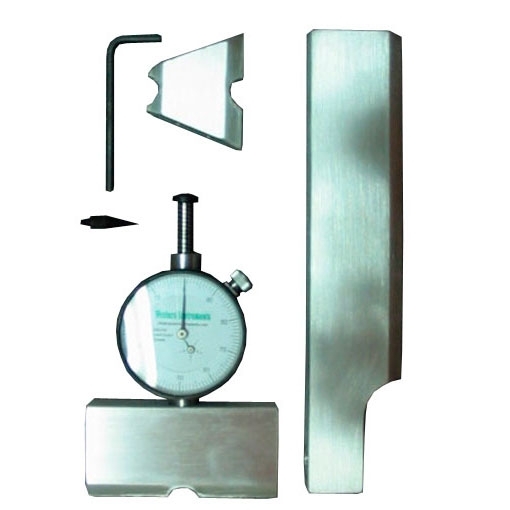 N88-SPR-D Spiker’s Pipeline Inspection KitSpiker has gone one step further by adding a Pocket Pit Gauge Blade. N88-VI Vessel Inspectors KitDue to customer requests, we now offer the Vessel Inspectors Kit.